It's the first day of March as I write this. For those, like myself, who live in the northern climes, the ground is still frozen and the air is chill. The first rumblings of spring are starting to show, however, and it's the time of year to plan out our gardens. The seed displays are out in the stores, the catalogs are in our mail, and our fingers itch to dig into the deep, sun warmed loam. Growing up on a farm, we always had a huge garden - well over an acre in size, at its largest point. Nearly half of it was potatoes! White potatoes and red - one year, we even had blue - row upon row of peas, corn, carrots, cucumbers, zucchini, lettuces, cabbage and so much more. It was a lot of work to maintain, but between the garden and farm animals, we didn't have to buy much at the grocery store! Then I moved to the city, and gardening became a thing of the past. It was many years before we even lived in one place long enough to start a garden, never mind somewhere with access to land. I want to clarify, however, that when I talk about gardening, I'm not talking about flowers. 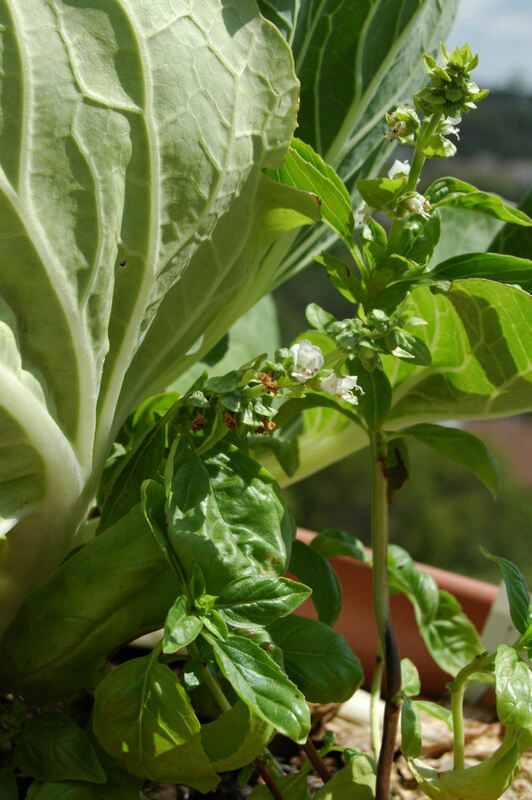 There's plenty of information out there on how to grow flowers on your balcony, but what about veggies? There's something very special about being able to put together a salad with greens freshly picked, just minutes ago, or having vegetables with your meal that are so fresh, they burst with a crunchy sweetness unlike anything else! Of course, it sure doesn't hurt to save some money on your grocery bill, too! Apartment living does not have to be garden-free living. If you're fortunate enough to have a balcony - even a small one - it's surprising how much you can grow! 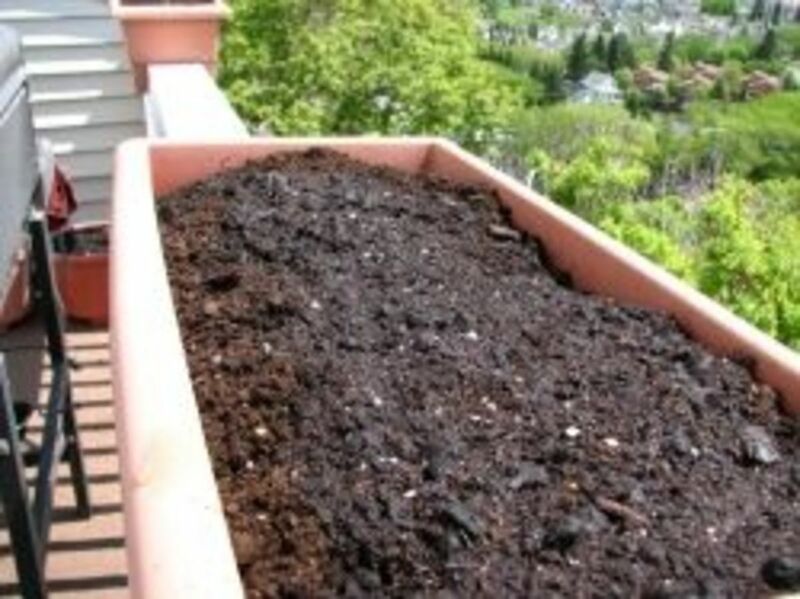 So if you're itching to get your hands in the dirt, save a bit of money on the grocery bill, have concerns about the safety of your food, don't have access to a garden plot, but do have a balcony, this is for you! Photo of one of my rail planters, taken March 22, 2012 - clearly I won't be planting anytime soon! 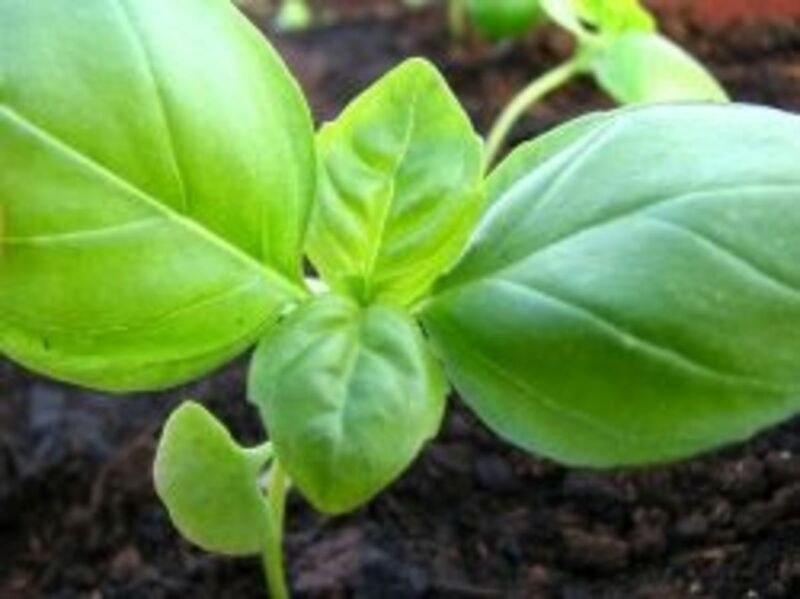 The first thing you'll need to determine, long before you start your balcony garden, is what do you have to work with? Here are just a few things you will need to take into account. Physical space - what are the dimensions you have available? Keep in mind that you need to be able to move around your containers, as well as be able to shift them, as needed. Do you have a sturdy railing? 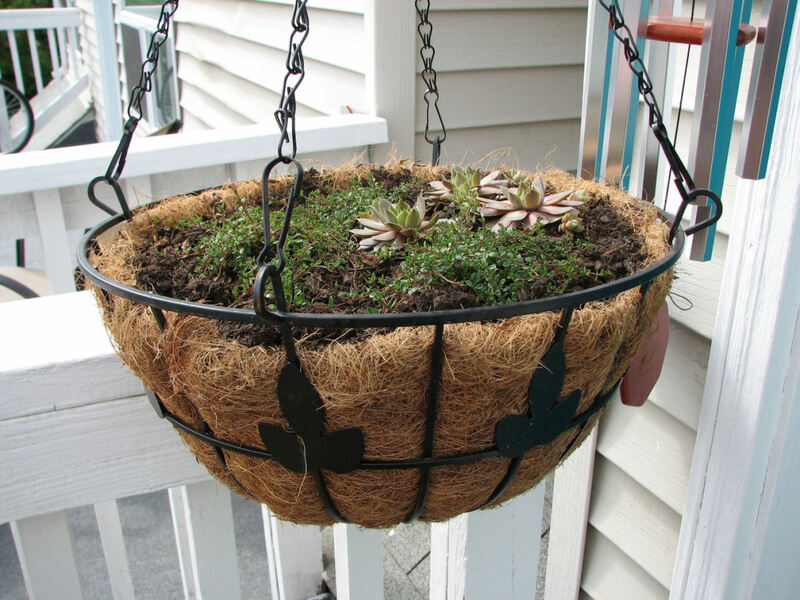 Perhaps you can place rail planters on them, or hang them on the outside of your rail. Is there a fire exit that needs to be kept clear? Do you have a roof/ceiling/overhang above your balcony? Is your balcony made of concrete or wood? 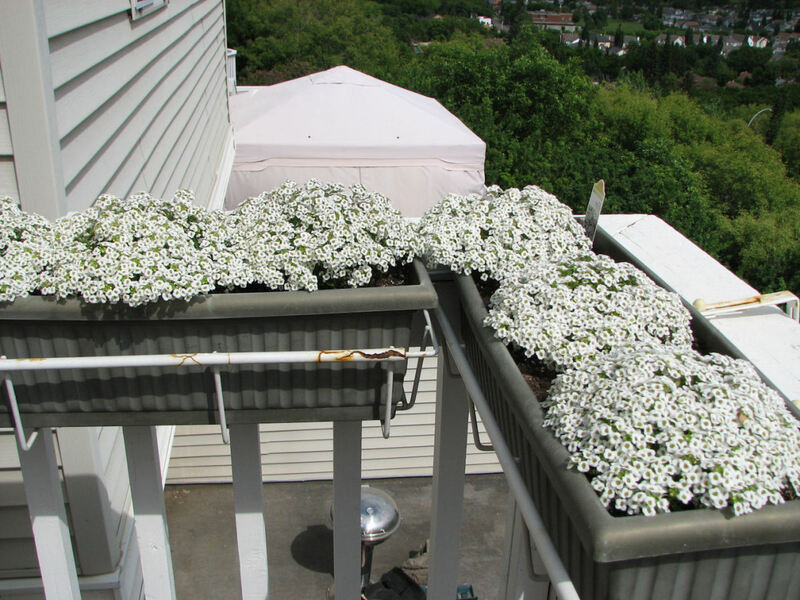 The weight of soil filled containers can quickly add up, and you want to be sure your balcony can hold it. How many walls do you have? Are you allowed/able to attach things to them? What else do you use the balcony for (bbq, storage space, tables and chairs...)? Light - how much natural light does your space get? Are you south facing, with full sun for most of the day, or north facing, with only indirect light through most of the day? Do you get only a few hours of directly sunlight at sunrise or sunset? Knowing how many hours of light your space gets will help you decide what plants you will be able to grow. 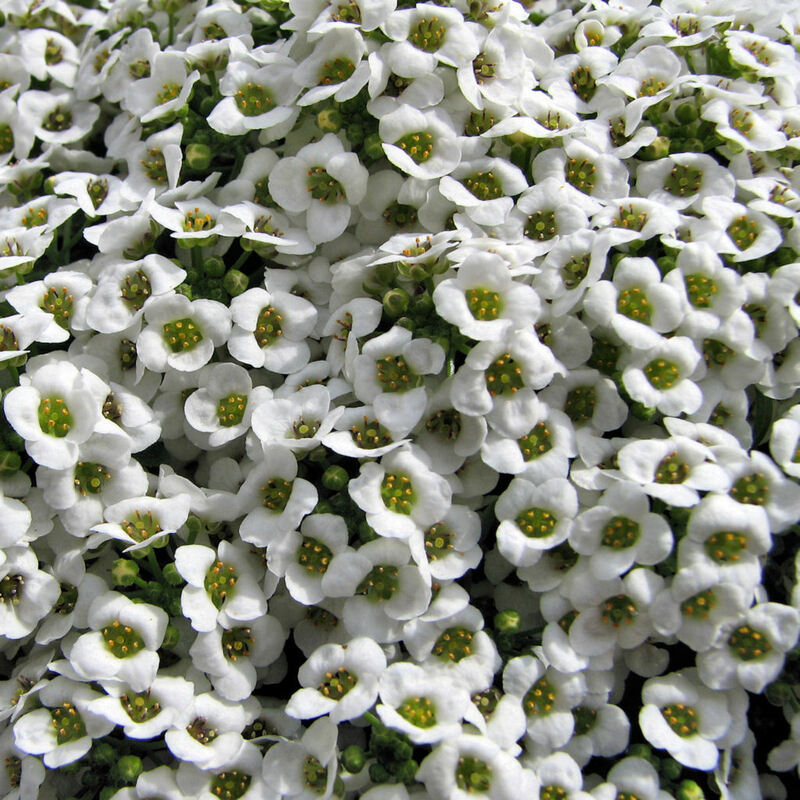 Some plants require many hours of full light, while others do better in indirect light or shade. Take the time to determine how the light and shade hits your space throughout the day, and keep in mind that this will change throughout the growing season. Your growing zone - go online, check out some seed catalogs or hit the books to find maps of growth zones for your region. When you figure out what zone you live in, you can use that to decide what seeds or plants have a growing season compatible with it. Remember, however, that on a balcony, you can break some rules! 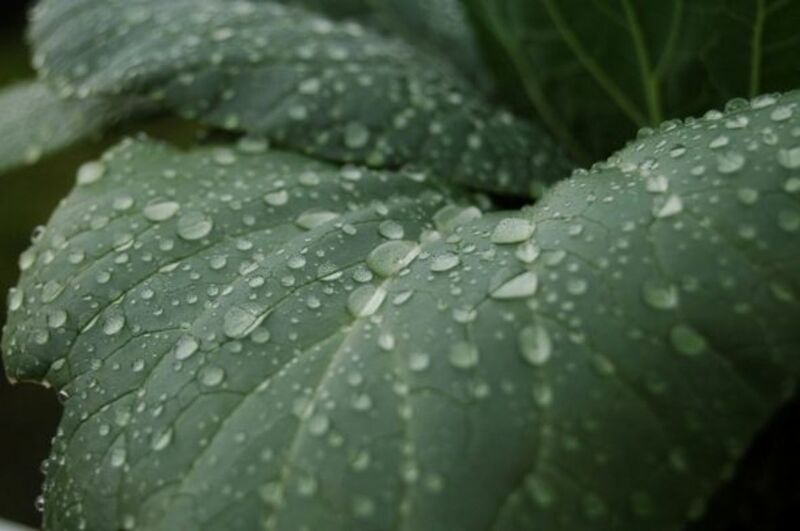 It's possible to create micro-climates that will allow you to grow plants that prefer a warmer or cooler zone, and there are ways you can extend your growing season. Use your region's zone as a guide to determine what you can grow, but know that you can push the limits a bit. To give you an idea of what to look for, here is a comparison of balconies we've had most recently. Before moving to where we are now, we lived in an apartment with a large balcony. It was very long, but fairly narrow. At one end was a storage space. At the other was a wall with a narrow opening at the rail (just big enough for a cat to fit through, we discovered) that lead to our neighbour's balcony. The floor was concrete, as was the ceiling, with stucco on the apartment wall and brick side/storage walls. We had a narrow steel railing. We had a bbq and a patio table, and needed to keep access open between the patio door entrance and the storage area. We also faced north-northwest and had no direct sunlight at all, and indirect sunlight for a couple of hours, at most, at sunset. We discovered that our balcony was oddly unsheltered. We were on the third floor (of a 19 floor highrise), which was low enough that street grit blew onto our balcony - enough that my thoughts of having a drying rack for our laundry were firmly rejected. We also would find cigarette butts and used matches on our balcony regularly. No one in our household smoked. These were from people who tossed them off their balconies above us. With this space, I did try to grow some seedlings we got for Arbour Day (jack pine and white spruce) on our patio table. They died. We simply didn't have enough light and, though we had three walls, gusts of wind frequently knocked down the containers I had the seedlings in. I figured that we could probably grow flats of lettuces successfully in that space but, in the end, decided it wasn't worth it. Then we moved to our current townhouse. It is on the 2nd and 3rd floor of a 3 level complex, and our balcony is on the 2nd floor. It is quite large and almost completely square in shape. We have the townhouse wall in the back, a half-wall on each side, a wooden railing in the front, and a fire escape near the rail in one wall. The top of the wood railing is about 6 inches wide. The balcony is made of wood, and the floor is covered with waterproofing and outdoor carpet. The walls are covered with siding. We face south and get full sunlight from sunrise to about an hour before sunset, when the light is finally blocked by a tree and other buildings. In this space, we have a bbq, a patio swing and a patio table (recently added), plus we have to keep a path clear to the fire escape. It is also where we store extra bags of soil and gravel, as well as a spare propane tank for the bbq. Plus, we want to keep the middle clear for activities. This leaves me with the patio table top, the rails and the sides not taken up by the bbq. We are also not allowed to attach anything to the walls directly. We discovered two problems with our location. First, with the amount of direct sunlight we get, the containers can actually get too hot, and the roots can start burning. 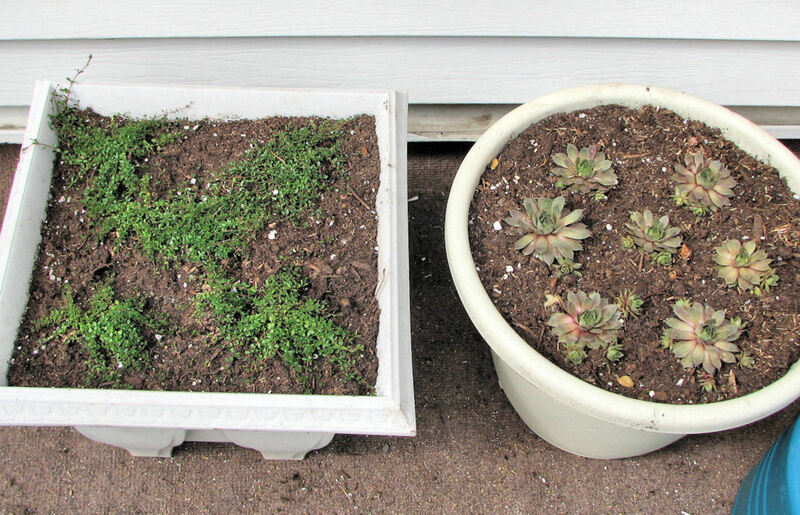 Containers need to be rotated regularly, and watered more often. This was expected. The second problem was more of a surprise. Wind. No matter what direction the wind is coming from, our balcony seems to act like some sort of funnel. There is no corner unaffected by the wind, which can swirl around with surprising violence. There is also no roof, so there is no protection from hail or driving rains. This means anything we grow has to be able to withstand a lot of direct sunlight (though I can create shade, if necessary) and be hardy enough to handle the elements. Taking the time to evaluate your space is a vital first step that will help you decide what you can grow, where and how to grow it, and save you from spending money on containers and plants that won't work in your location. Photo above, taken March 22, 2012, shows my two rail planters spaced far enough to fit our barbeque in between without either being affected by the heat. They can be easily slid from side to side if we need to. Our oregano did very well. 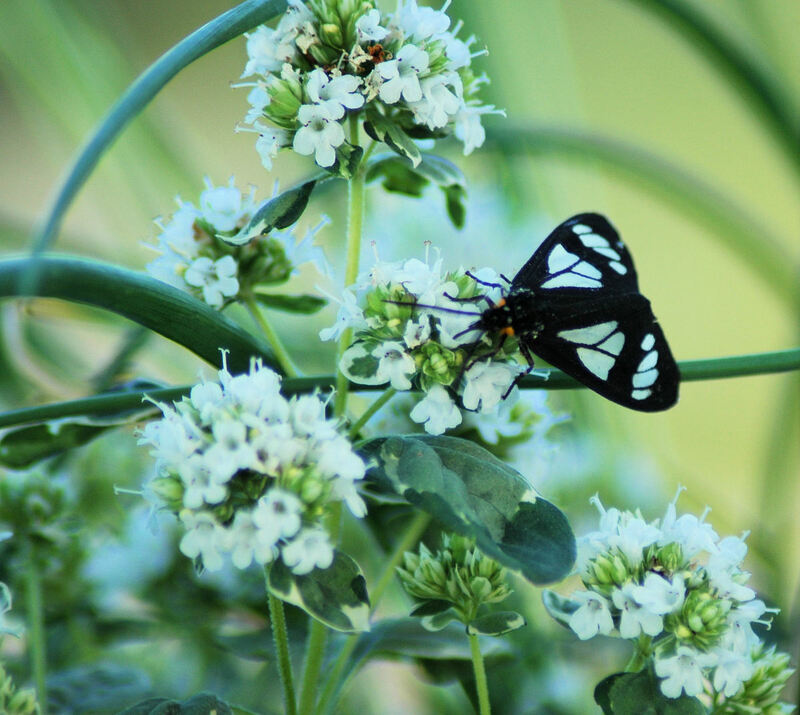 Oregano blossoms brought some beautiful visitors. A bee visiting our Boy Choy. We allowed some to go to seed and collected them for the next year. What you grow decides how you grow! Figuring out what containers you need. Now that you've evaluated your space as much as you can this early in the game, it's time to decide what you want to plant. 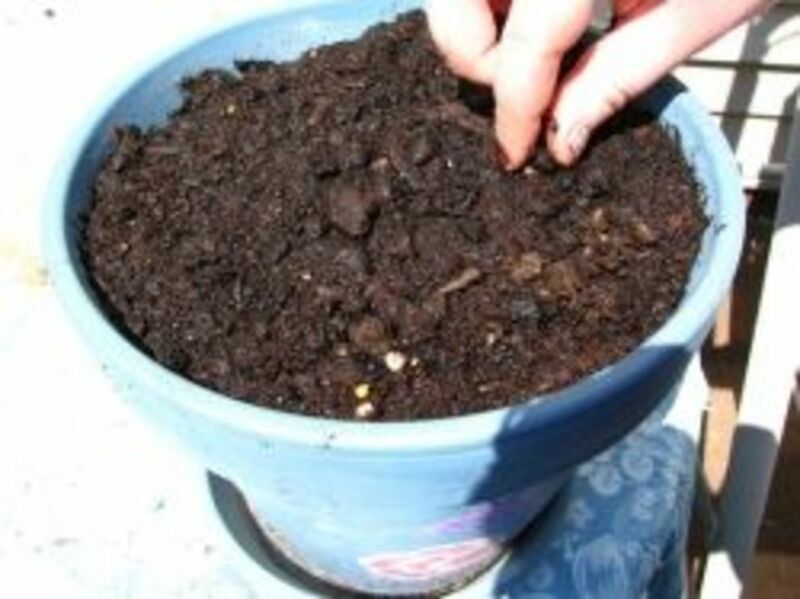 This will also help you figure out what size of containers you will need, how much and what type of soil, etc. 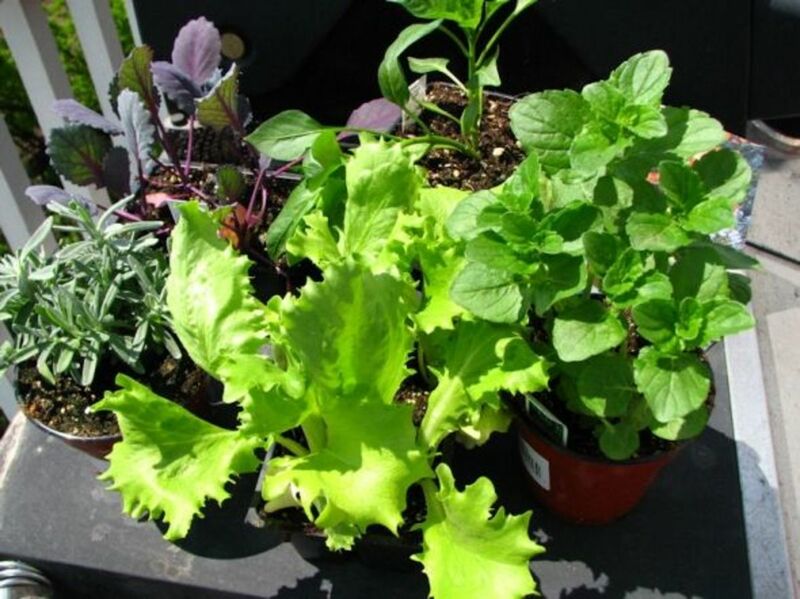 Some of the easiest edibles to grow are a selection of herbs, lettuces and salad greens. Many do not require particularly deep containers, so you can get creative in using your space. 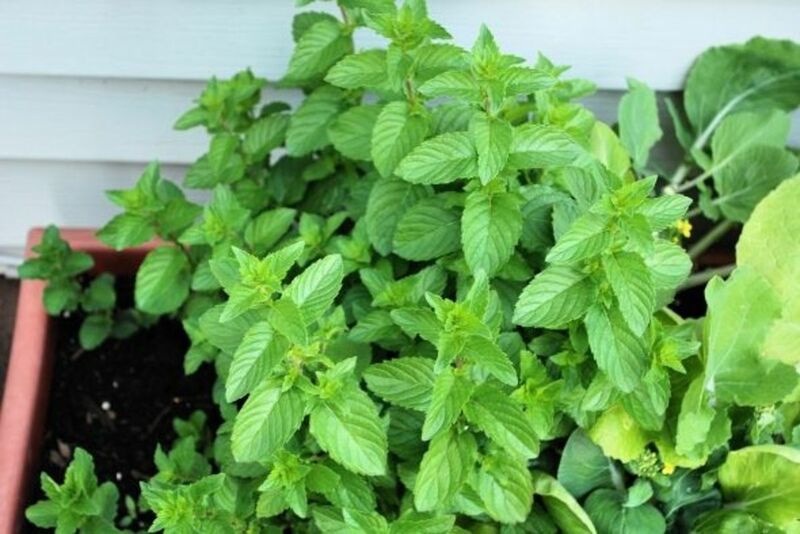 These are a great choice to start with, especially if you want to increase the amount of healthy greens you eat, but find that store bought greens tend to spoil with shocking speed (I've had a package of herbs go fuzzy and slimy overnight!). Root vegetables can also be grown in containers, so long as they are deep enough. Some food plants can be started indoors to lengthen the growing season (the middle of March is a good time to start most seeds indoors). If you don't have the space, it may be well worth the extra cost of buying at a local greenhouse, instead. With some types of plants, it's good to evaluate whether it's worth growing yourself. Potatoes, for example, can be an excellent plant to grow in a container, but when you balance the cost of materials and soil needed, it is unlikely to be worth the investment for plain Russets, which are already so inexpensive in stores. 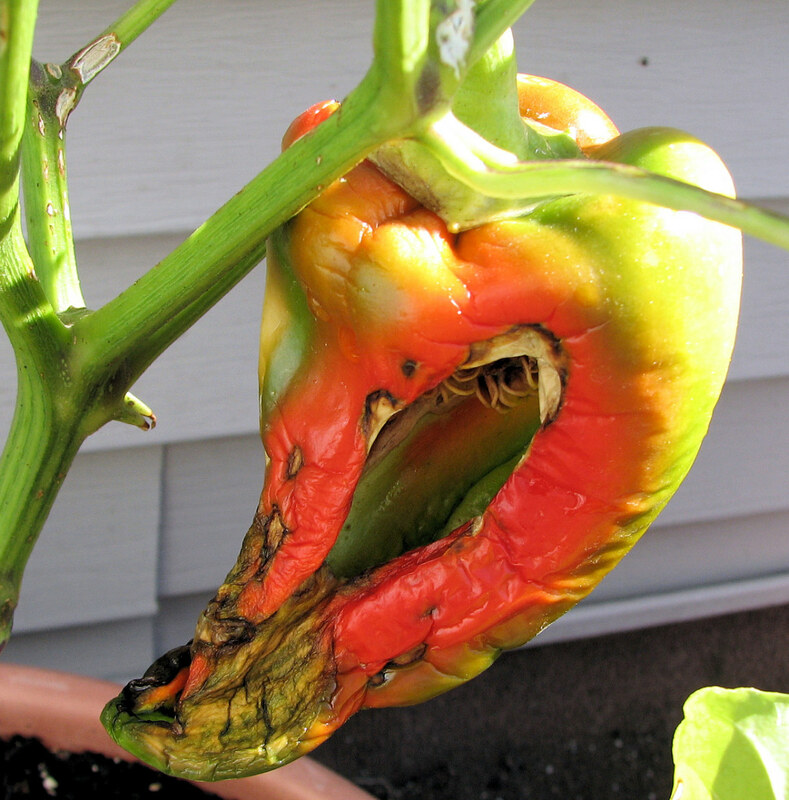 If you want to grow heirloom varieties, however, it might be well worth the investment. Spend some time going through seed catalogs and their company websites. 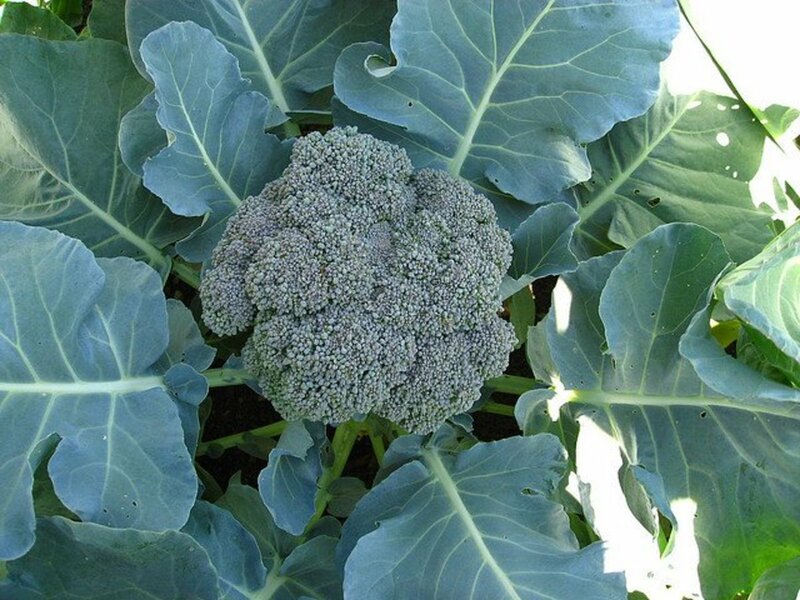 Some of your favourite vegetables might be available in dwarf varieties that would be great in containers, and some companies now specify if certain varieties of vegetables are good for container planting. Don't forget fruits and berries! Quite a few varieties would do quite well in containers. Other things to keep in mind are extra materials you many need to invest in. If you want to grow climbing plants, such as cucumbers or squash, you might need to invest in a lattice backing, poles, or some other method of giving your vines room to grow. 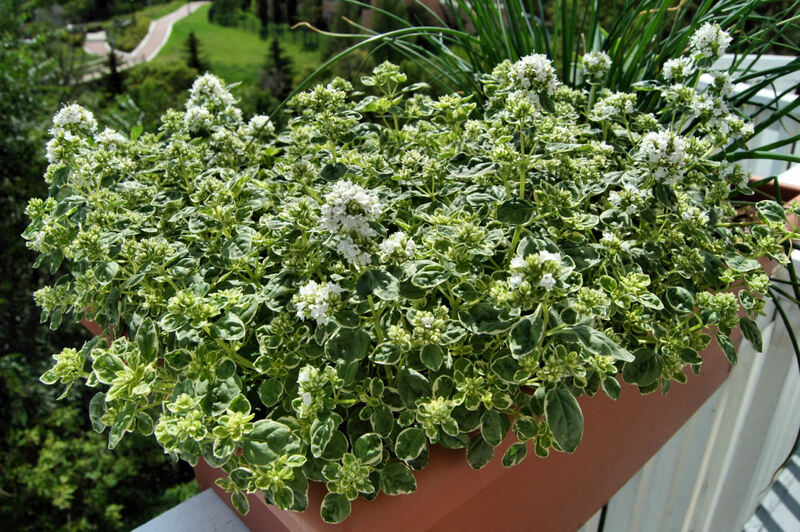 For a new balcony garden, start with just a few containers and plant varieties. Your first year will be a learning experience, and you will discover things about your growing space that you missed when first evaluating your space (like we did, with our wind problem!). 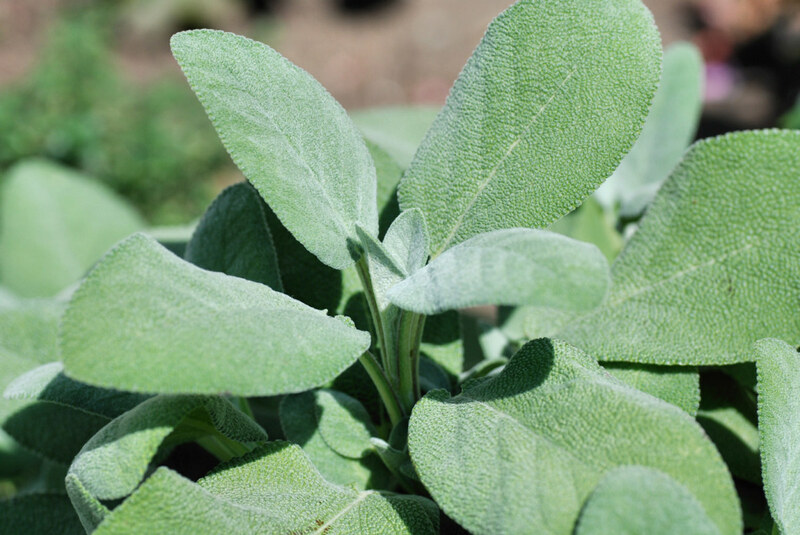 Choose plants you know you and your family will enjoy and eat on a regular basis. Once you have a list of potential plants to grow, it's time to do a bit of research. How much growing space do individual plants need (when growing in containers, you won't need to take into account the recommended space between rows), and how deep do their root systems go? What are their growing habits? 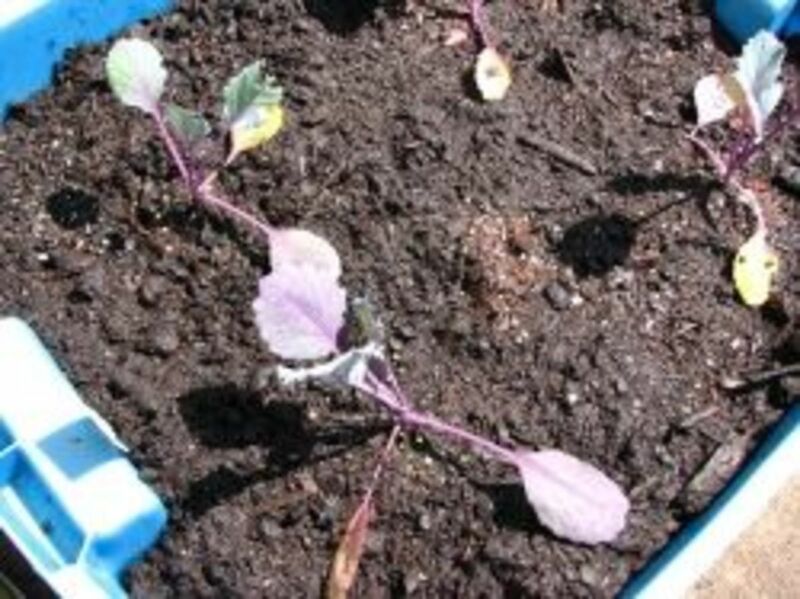 Some varieties of plants, like spinach or Bok Choi, have a tendanc to bolt (shoot up and go to seed) if they get a lot of sun and warmth. Will you be able to give them the shade and cooler temperatures they need, or should you look into different hybrids that are less likely to bolt? 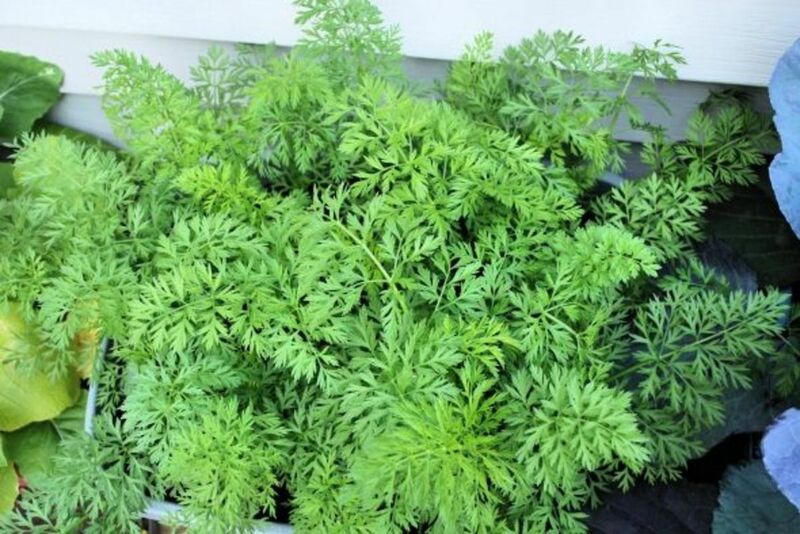 The next step will be the largest monetary investment in your balcony garden, but for many of these items, they will last you for many years. It's time to get your containers! 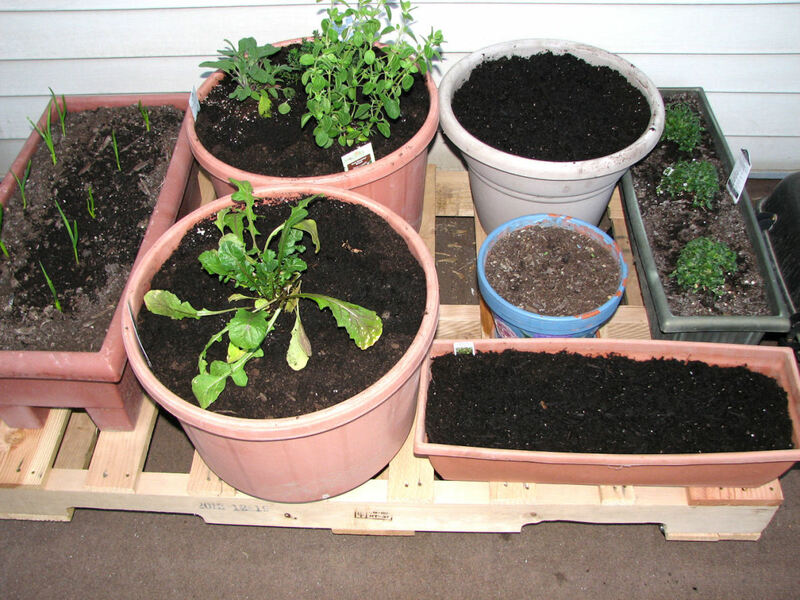 Choosing your containers and gardening methods. When you have a limited area to work with, it helps to be creative in using every inch of it! 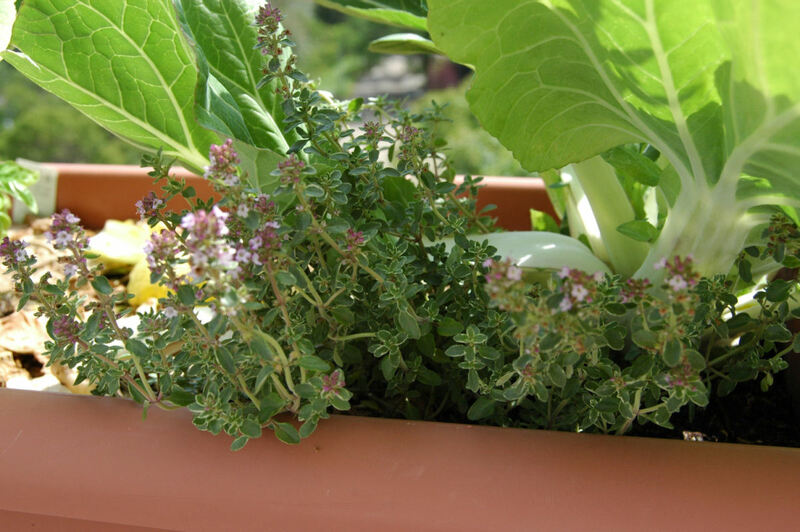 For plants that don't require deep pots, you can take advantage of this and try some unusual and innovative growing methods. Here are a few ideas and suggestions. Some plants can grow quite well hanging upside down. If you have a roof over your balcony you can hang planters from, or are able to attach brackets to your walls, this is a great way to increase the space you have available. Tomatoes, strawberries, cucumbers and peppers are among the plants that can be grown upside down. If hanging upside down isn't an option, perhaps you can still do hanging baskets. Herbs, lettuces and strawberries can do quite well in these. Keep in mind that you will need to be able to reach the baskets for watering, so you will either need to mount them within reach, or invest in tools that will help. Make use of your walls, if you have them or can attach things to them. One handy trick is to attach roof gutters directly to your walls. Several can be mounted, one above the other, providing planters for shallow rooted plants such as lettuces and some types of herbs. Other options include stepped planters (or planters resting on the rungs of a step ladder), lattices, or towers, such as strawberry pots, with openings in the sides to plant into. On the rails. 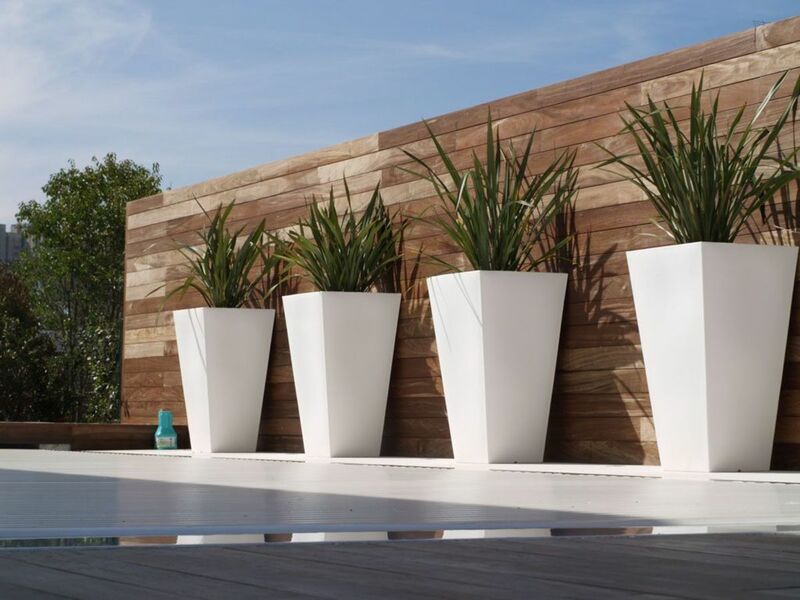 There are long, narrow plant pots specially designed to fit over rails that are either 6 inches or 4 inches wide (our balcony rails are 6 inches wide at the top). For other rail types, you can get brackets that hang on your rail and hold the pots on the side, rather then on top. These have an extra bonus, in that you can hang your pots on the outside of the rail, or both sides, giving you a bit more space. Raise it up. For those with mobility issues, keeping your pots on small tables can be useful. If bending is a problem, low tables similar in height to a coffee table can be enough. For those in wheelchairs, a higher table with room enough to wheel under, with shallow pots or trays to plant in, can work quite well. Go deep. For many plants, you just have to go big! Larger containers with depths of 12 - 24 inches work well for most plants. Potatoes can be grown in rain barrels or plastic garbage bins - start with a smaller amount of soil and add more as your potatoes grow, and you will soon find yourself with a remarkable amount of potatoes from just two or three plants! As you can see, getting the materials for a container garden can be a significant investment! Another reason to go slow in the beginning, and start with just a few pots. There's no rule that says you have to use actual plant pots to grow in! Storage bins, plastic buckets and other creative containers can be used. For some plants, you don't need a container at all - just use the bag your soil is in! Lay the bag flat and cut X shaped holes, spaced appropriately for your plant of choice, then transplant your seedlings into the openings. Make sure the openings have room for watering. 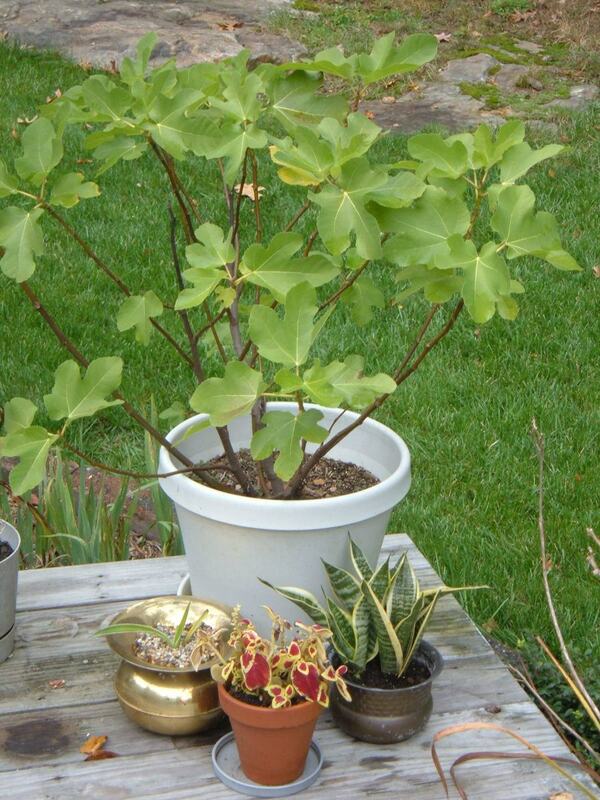 Check out garage sales and reuse and recycling centres for containers suitable for planting. For short term use, you can also use cleaned and cut down 4L milk jugs or 2L pop bottles. The type of soil you get will depend on the plants you grow, so do a bit of research on that, as well. When preparing your containers, make sure there are drainage holes, or that you can add about 2-3 inches of gravel and sand at the bottom for drainage. 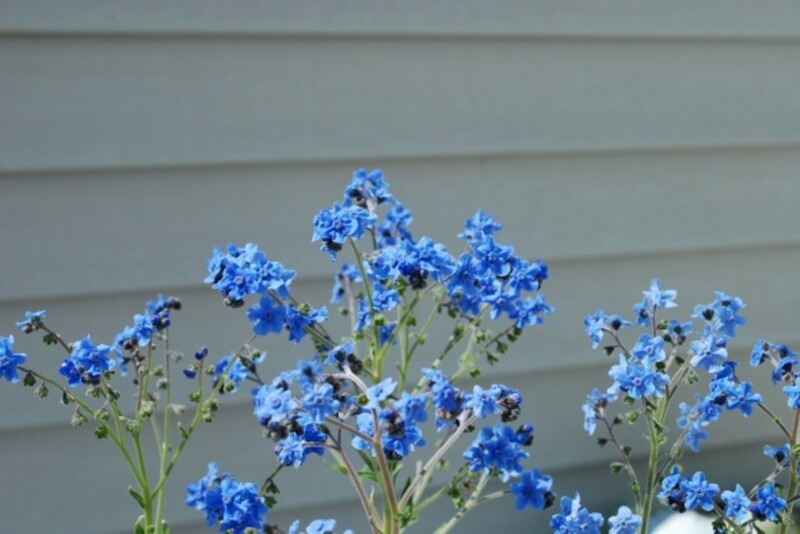 With containers, you will need to water and fertilize them more often then in a garden plot. Choose your plant food with care, and follow the directions carefully. 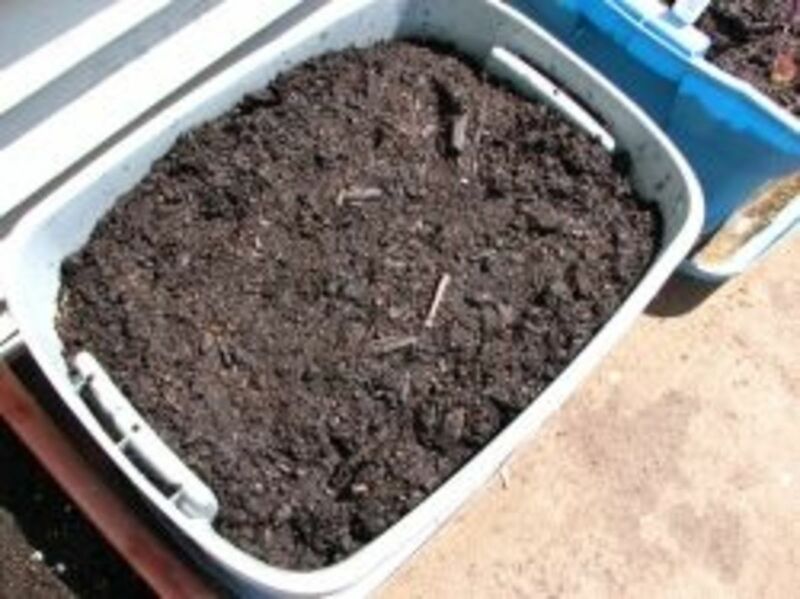 You may also want to consider building a compost bin with red worms - they will happily eat up your vegetable waste, and reward you with a rich soil in return! Okay, so you've chosen what you want to grow. You've invested in pots and soil. You've either started seeds indoors, picked up transplants, or are ready for direct sowing. The weather has finally co-operated, and it's time to get your hands in the dirt! Your new balcony garden is finally in. 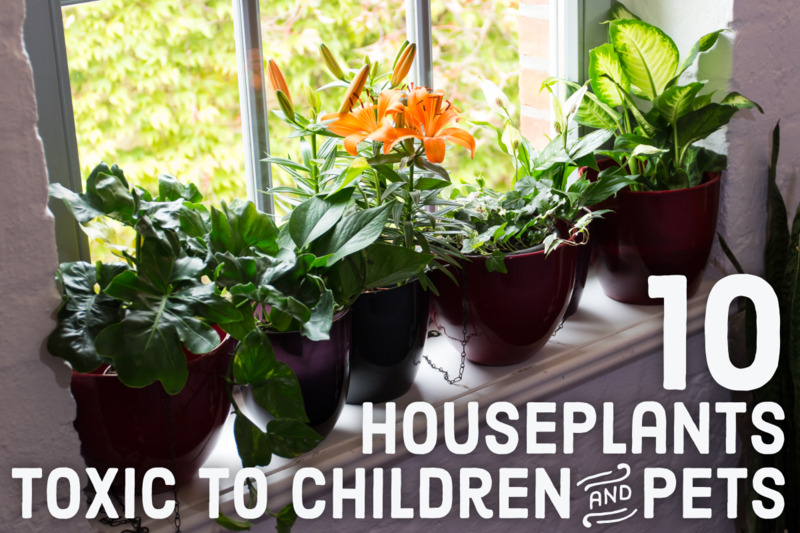 Over the next few months, you will get to enjoy tending your garden and watching those tiny seedlings and transplants grow into beautiful, healthy plants. At least you hope they turn out healthy! Some things you just won't have much control over. Like the weather. The photo you see here was taken in June! Some years, summer just doesn't bother showing up. There are things you can do to protect them from the elements (including taking your pots inside, if all else fails and if you have the space), but there are always limits. With a dry year, you can at least keep watering your containers, but there's not much you can do if it's too cold, too rainy or too hot. With containers, you will generally need to water more often, and turn the pots so that all sides get equal amounts of sunlight. You may wish to put larger pots on small wheeled platform to make that particular job easier! If you are south facing, turning the pots will also prevent roots from burning as the south facing sides absorb the sun's heat. With some plants, like lettuces and carrots, you can do successive sowings every few weeks to extend your harvest. 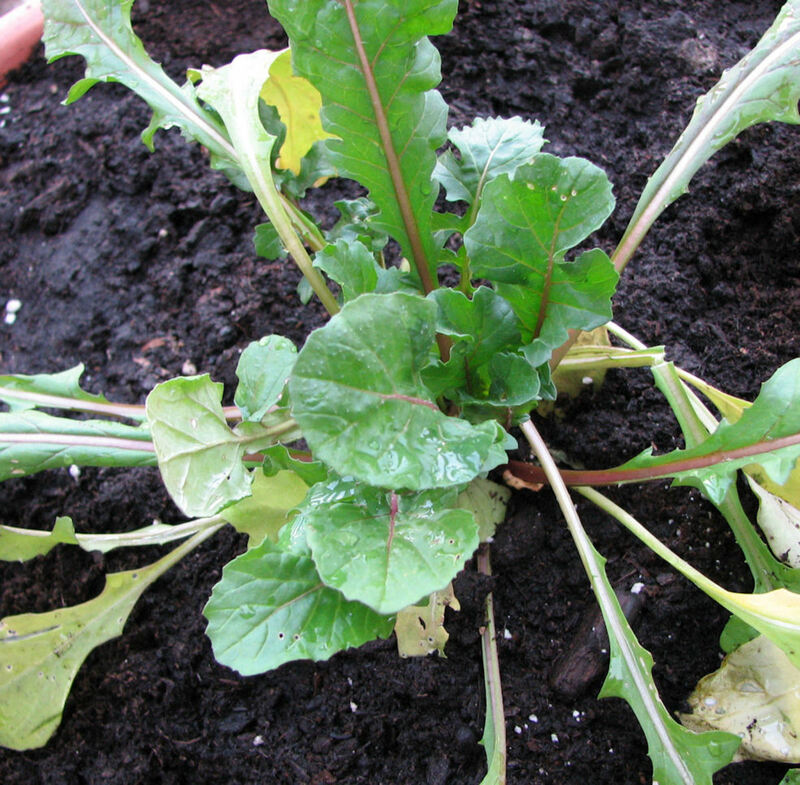 Some plants are good for eating quite quickly - young beet leaves are great in salads, along with most lettuce types. Read up on the types you've planted, so you know when it's safe to start harvesting, and what the best method is. 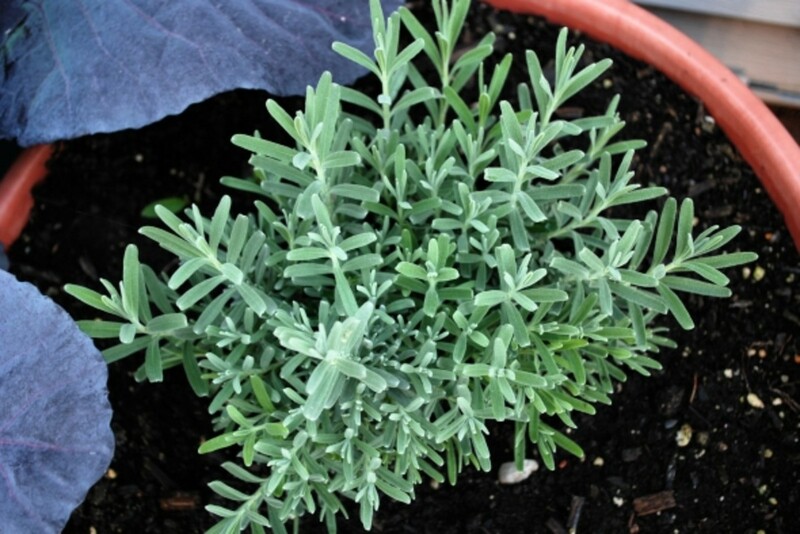 Herbs are usually best harvested earlier in the day, after the dew dries, but before it gets too hot. 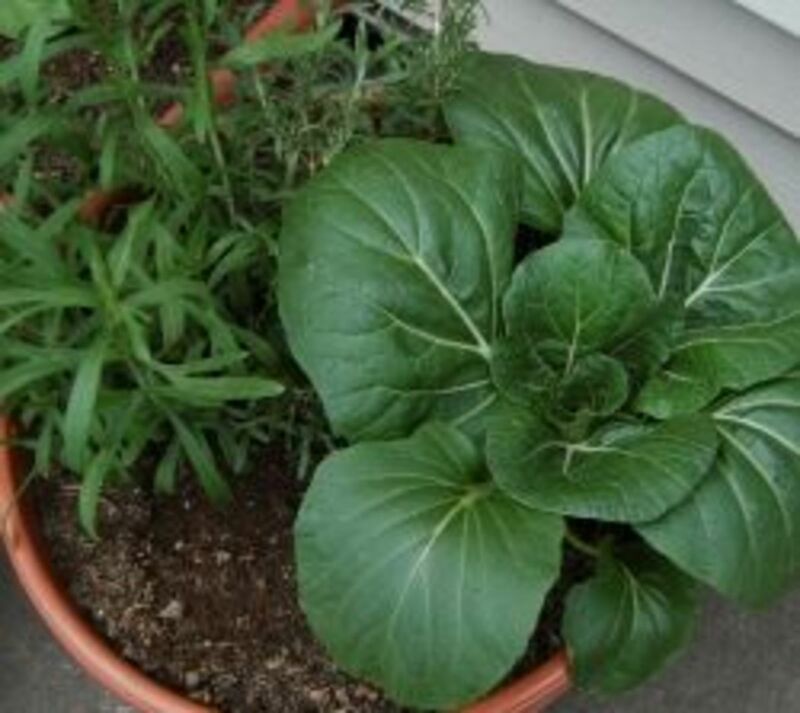 You can harvest young Joi Choi (a hybrid Choi that resists bolting) whole, or leave them to grow larger and harvest only a few leaves as needed. Keeping plants trimmed to prevent flowering keeps the leaves from growing bitter, while some, like chives, have edible flowers that you will want to encourage. 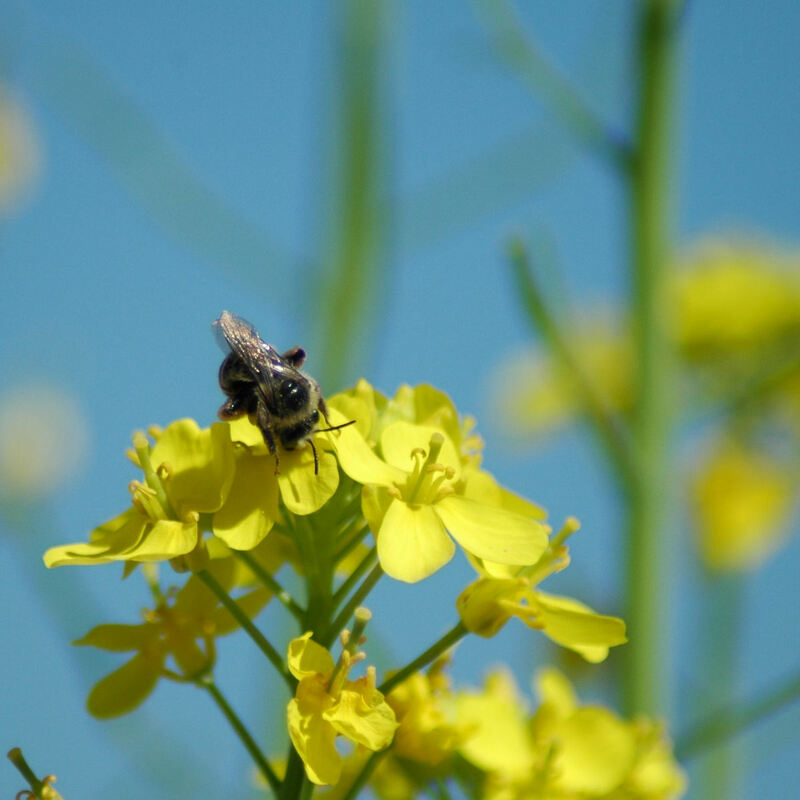 You may even want to deliberately let a few plants go to seed and collect them at the end of the growing season. Most vegetables and herbs will produce viable seeds, but you might want to double check your varieties, as some hybrids will revert with successive generations. I have had great success collecting seeds from my Joi Choi, as well as oregano and thyme. As you tend your plants, you will learn what varieties grow well in your space and which won't. 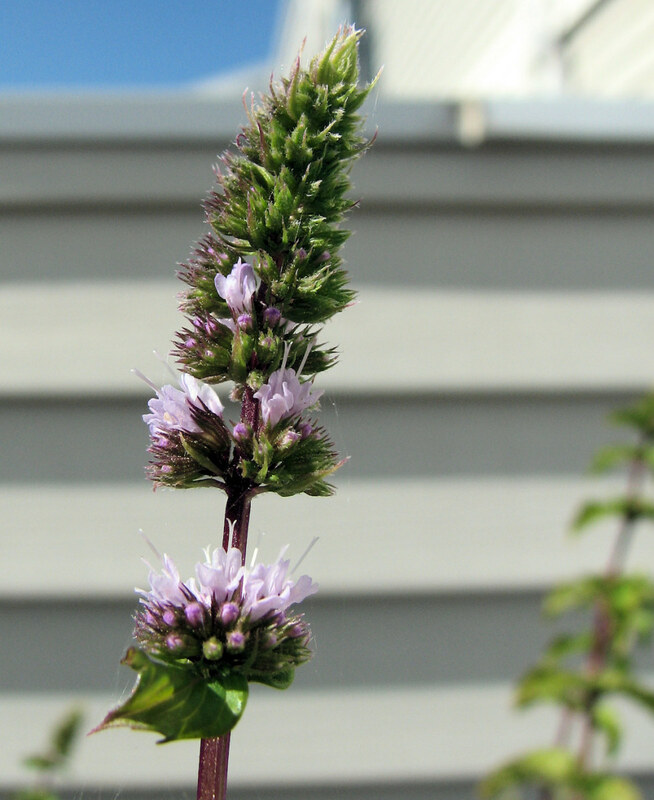 On our current balcony, I've learned that I can grow oregano well, but not basil. Joi Choi does well, but not carrots. Lettuces grow well at the start of the season, but successive sowings don't seem to work out well at all. You may wish to keep a notebook to record what plants you tried to grow, what containers and soil you used, and how well they did. You may even wish to keep a photographic record of your plants - and if photography is a hobby, your balcony garden can provide ample opportunities for excellent photographs throughout the year! Meet Felix. Isn't he a beauty? He really enjoyed my thyme blossoms. Okay, so you don't need to know your bugs by name! Or even by type. 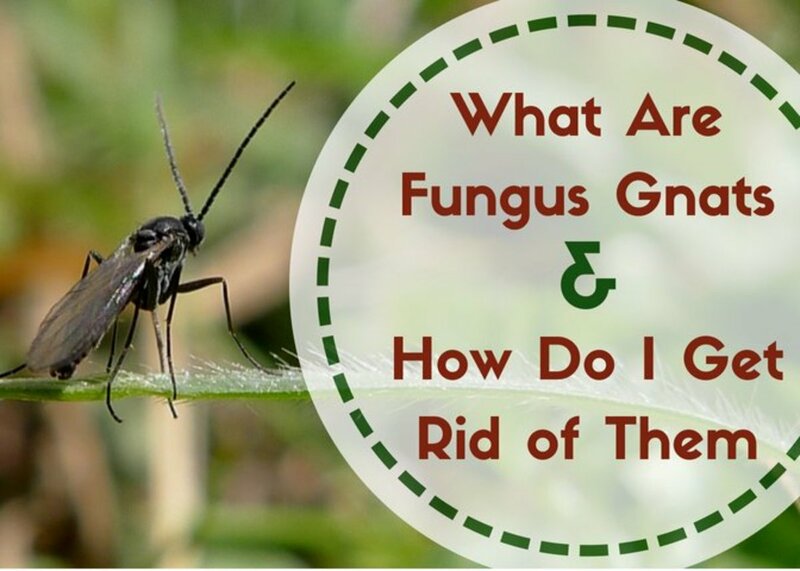 One thing about gardening you're sure to deal with, however, is bugs. Most of the insects that visit your balcony garden are doing them good, or are at least neutral. Some types, like ladybugs, eat other types that harm your plants, like aphids. Felix, here, wasn't going to do my thyme any harm, but I wouldn't want him around if I had tomatoes or fruit trees. Most of the time, you can let nature take its course, and just worry about washing your plants well when it comes time for eating. 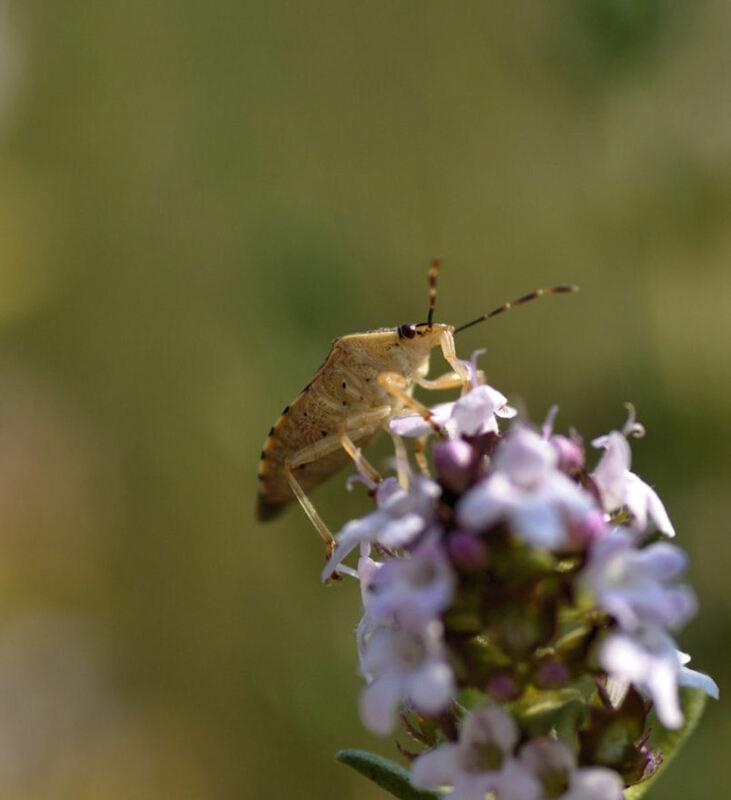 Here are some websites that will help you figure out if the insects visiting your garden are something to worry about. May 20, 2012 - finally planting! - The Victoria Day Weekend is planting weekend. For the climate I live in, this is the weekend after the last danger of frost, and most people finish putting their gardens in. Weather willing, many have already put out their hardier plants by now. I didn't have space to start seeds indoors, so I bought a few transplants. There are some new ones this year, and I hope they turn out. I've also got some seed packets out as well. The first order of business is to prepare the planters with new soil and a thorough watering. In the photo are my two rail planters that actually fit my balcony rail. I do have another, but accidentally bought one the wrong size. By the time I realized it, I had already planted in it! This would be the time to thoroughly mix in any slow acting fertilizers you might be using. I bought a tray of four head lettuce transplants. For the space they need, I put two in each rail planter. I also seeded some beets in between and in the corners. 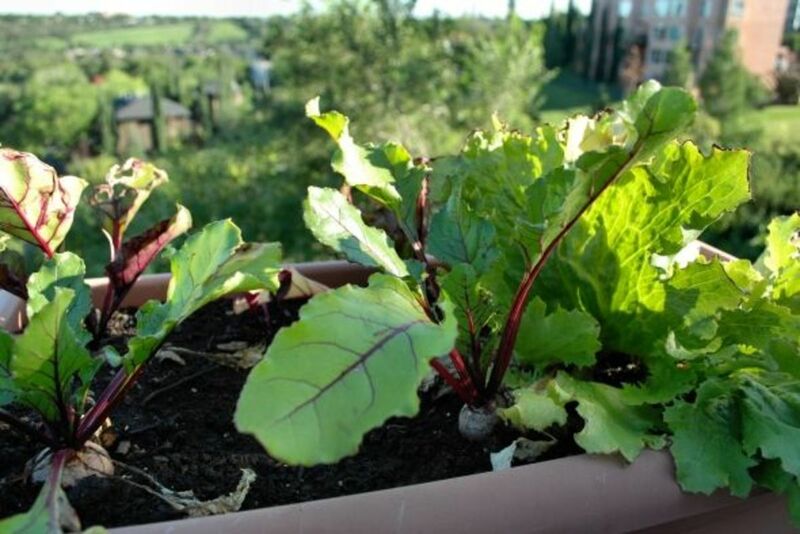 Beet greens are edible, and they are good companion plants for lettuces. 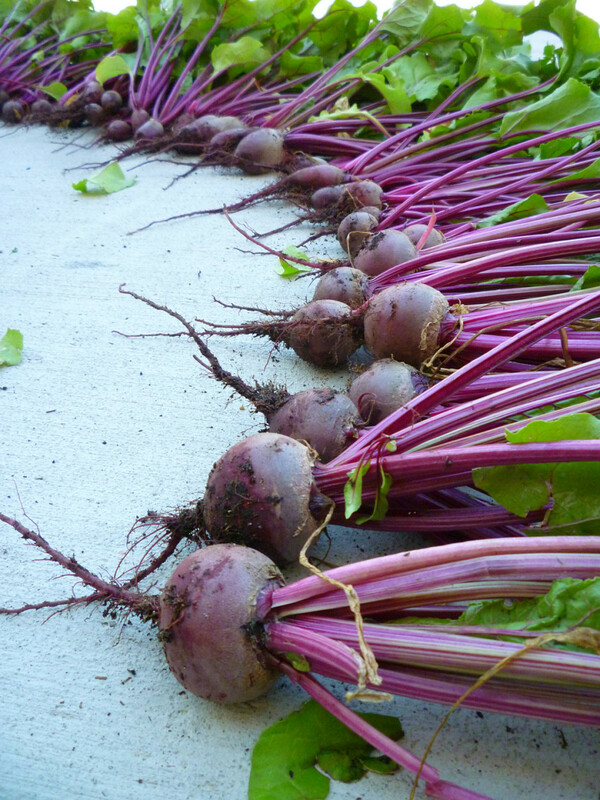 Both beets and lettuce can be successively sown to extend the growing season. This is a new one for me - English Lavender. Because of the expected size, it got its own large pot. 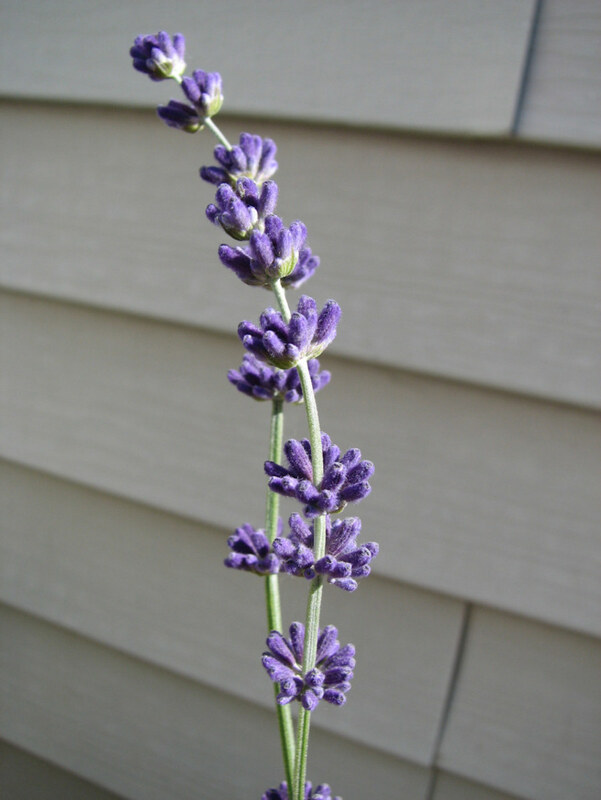 I am hoping to have lavender flowers to dry for use in my Christmas crafting this year. 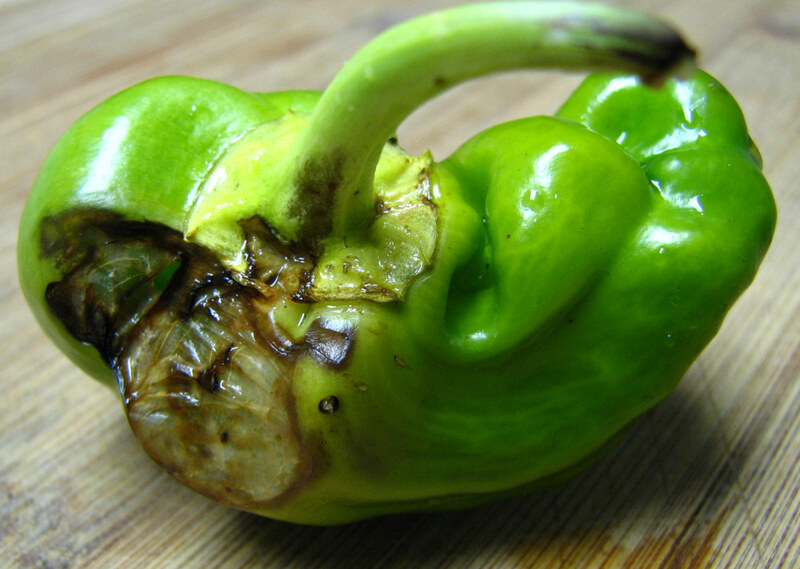 Bell Pepper - - and friend? Another new one for me is green bell peppers. I personally cannot eat peppers, no matter how delicious they smell or tempting they look. They make me gag. Odd. My husband enjoys them, though, so I wanted to try growing some for him. When digging this pot out to prepare it for transplanting, having already pepared it a while ago, I discovered something growing in it. I honestly can't tell if it's a weed or not, so I've left it to see what it is. Gardening can be a mysterious adventure! My planter here is a fairly large storage bin. When it comes to larger containers, storage bins can be a much more economical substitute for large planters. Holes were drilled in the bottom, and the lid is kept under it, upside down, to catch the drainage. These are both plants I've grown before, but never in containers. 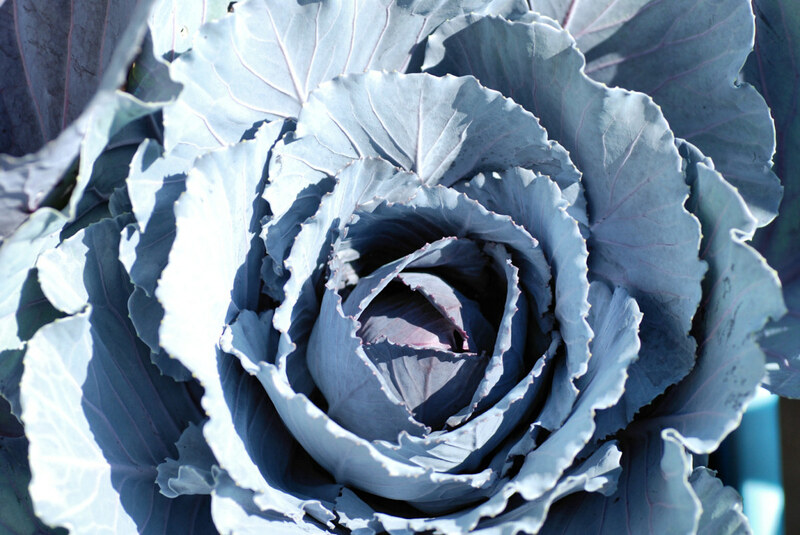 Part of the reason I chose red cabbage is not only for eating, but to use the leaves as a natural dye. Dill makes a good companion plant for cabbage, as it helps keep away the insects that will eat them. Not much of a worry on my balcony, but that's okay. I love to use the fresh young leaves in cooking, and I hope to have enough to dry as well. The seeds are good for cooking and pickling, too. Leaving dill long enough to go to seed does entail the risk of self-sowing. This is not necessarily a bad thing. I don't think my mother has sown dill in years, but she still has some come up in her gardens every year! I have a second, slightly smaller storage bin I used to sow purple carrots. I tried them last year with not very much success. I'm hoping this year will be better. This bin has 3 rows of carrots sown. I've tried different types of mints before, but this is the first time I've tried spearmint. I'm looking forward to using it in drinks, and to dry some leaves for tea in the winter. With the mint, I've sown seeds collected from previous gardens. On one side is some oregano and on the other is some joi choi. Joi choi can grow quite large, but I plan to harvest it for eating before it grows to full size. My younger daughter helped me with the planting this year, plus she seeded her own special pot. This past winter her cat, Harley, suddenly fell ill. We took her into a veterinary hospital, but it turned out to be massive kidney failure, and she had to be put down. The veterinary hospital sent us a card with condolences and a packet of Forget Me Not seeds. I don't normally do flowers at all, but my younger daughter enjoys flowers a lot, and she planted these seeds in memory of Harley. 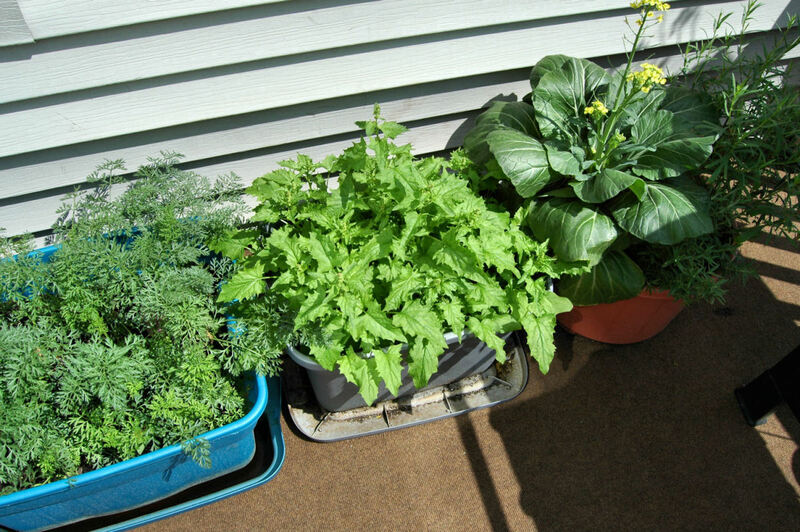 Container and raised bed gardens tend to need more watering then regular garden plots. For a balcony garden, this adds an extra challenge to gardening. If you have access to a rain barrel for watering, consider yourself blessed! A good watering can that gently waters your plants is a must, but when watering planters that are on tables, rails or walls, you'll want to avoid one that's too large and unweildy. A smaller watering can will need frequent refilling. My usual habit was to keep a full watering can on my balcony, so that when I do water may plants, the water temperature matches them. When I was done watering all my plants, I'd refill the container and leave it full for next time. The best time of day to water plants is early in the morning, before it gets too hot, or later in the evening when it starts to cool down. On the hottest of days, though, when the plants start drooping, they'll need some fresh water to perk them up. The size of my watering can means frequent refills, and frequent refills from my kitchen sink not only means many trips through my home, but after a few trips, the water gets quite cold. With the hot summer days, that cold water can really shock the plants and their delicate roots. This year, I've found a solution to my problem, and it's thanks to a change in packaging from our brand of cat litter! Instead of the 18kg cardboard boxes we used to get, it now comes in plastic containers with a molded handle at the top. After a thorough cleaning, I now have 4 of these, with lids so no bugs get in and drown, about 3/4's filled with water on our balcony. One of them was enough for all the planting and transplanting we did, saving us many trips into the house for refills! The only down side is that they are too tall for our kitchen sink, so they have to be filled in the bathtub upstairs. Even so, keeping these containers of water on the balcony is going to be very handy! 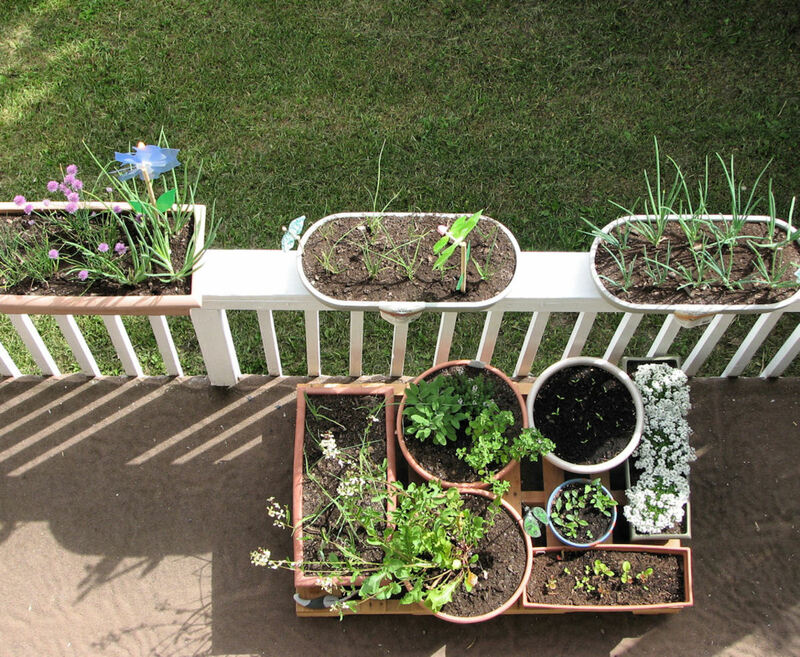 Here are a few websites to help you plan and grow your balcony garden. A 7 page pdf covering all you need to know about some basic vegetables that can be grown in containers. A short piece covering the basics. 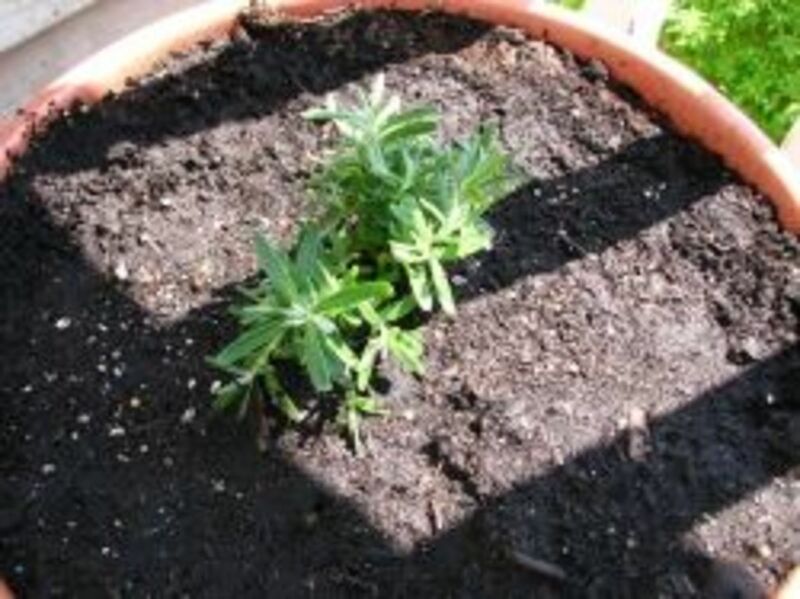 Soil preparation and plant care. A quick run through, as well as a list of vegetables that do well in containers. 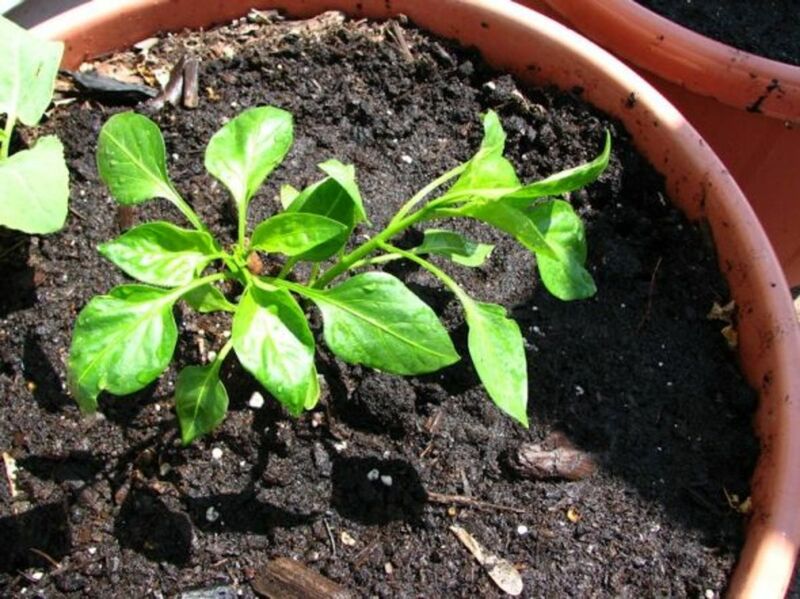 Ideas for three different ways to grow vegetables. Includes video instructions for patio tomoatos. 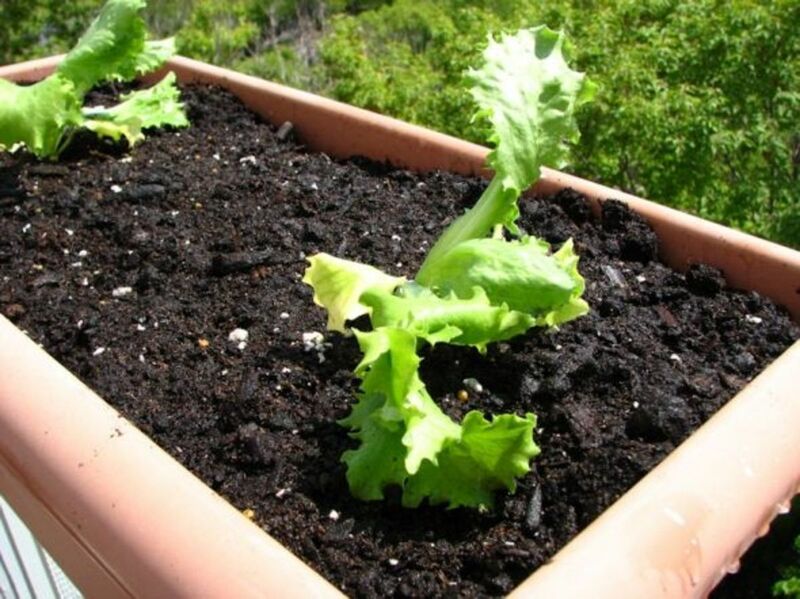 Growing Vegetables in Containers: Which Plants Grow Best? A quick run through which vegetables do - and don't - do well in containers. There's just something special about gardening. The pleasure of working with plants and soil. That special happiness that comes from watching plants thriving under your care. Vegetable gardening has its own special gifts, as you and your family enjoy the fruits of your labour. If you have children, it's a great way for them to learn where food comes from, and they're sure to enjoy their food more when they helped grow it themselves! Gardening is not just good for our bodies, but good for our souls. There's just something special and meditative about it. Even if you have limited space available, I hope the information here will encourage you to try your hand at gardening. I am sure you will find it well worth it! 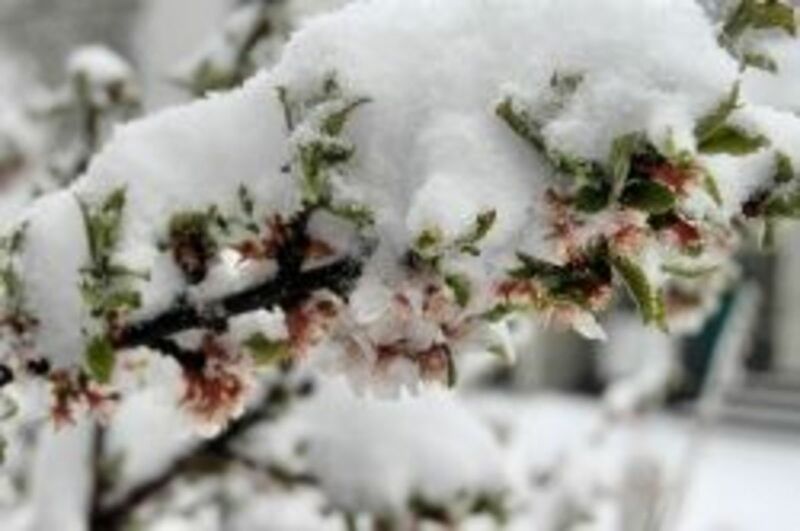 This year was a great, yet precarious, year for gardeners in Edmonton. After years of drought conditions, we finally had a summer with a lot of rainfall. Most of it came as torrential downpours. Our own balcony garden was doing quite well, until one of those storms came with hail about 2 cm (1 inch) big! 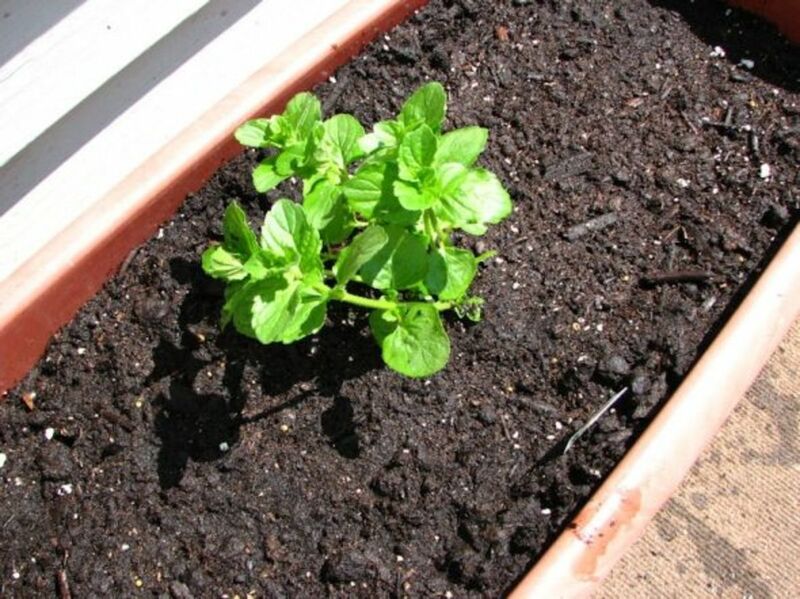 The spearmint did quite well in this planter, but the joi choi didn't do well, and the oregano didn't even sprout. The lavender grew a lot more slowly then I expected. Three peppers started to form on our one pepper plant. It did very well... at first. 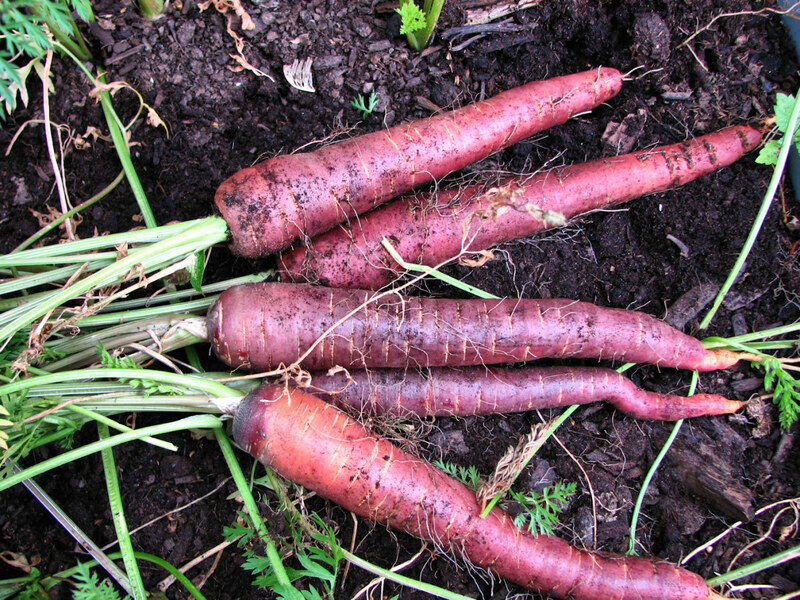 This was the third year we attempted to grow purple carrots. Once was from transplants, another from seed. Both failed. This year, they did extremely well, even though I was using old seed! The Forget Me Nots from the seeds given to us by the veterinary hospital that tried to save my daughters cat did all right in the end. We weren't sure how they'd survive the storms, but they surprised us and bloomed quite prettily. 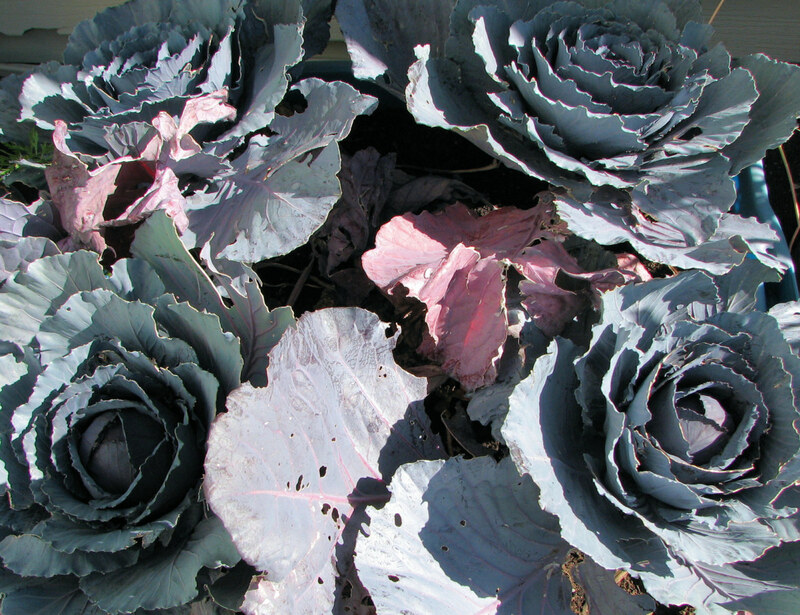 The purple cabbage did quite well, even in what was really too small of a bin for four plants. Two would have been better. In August we got the largest hail storm I've personally ever seen - and the hail we got was not as big or as heavy in other areas! Here is a video I took with my camera phone of the storm. Hail damaged the peppers that had been doing so well. This year, the purple carrots did very well - and with 3 year old seeds, too! The hail storm wasn't able to damage these deep roots. 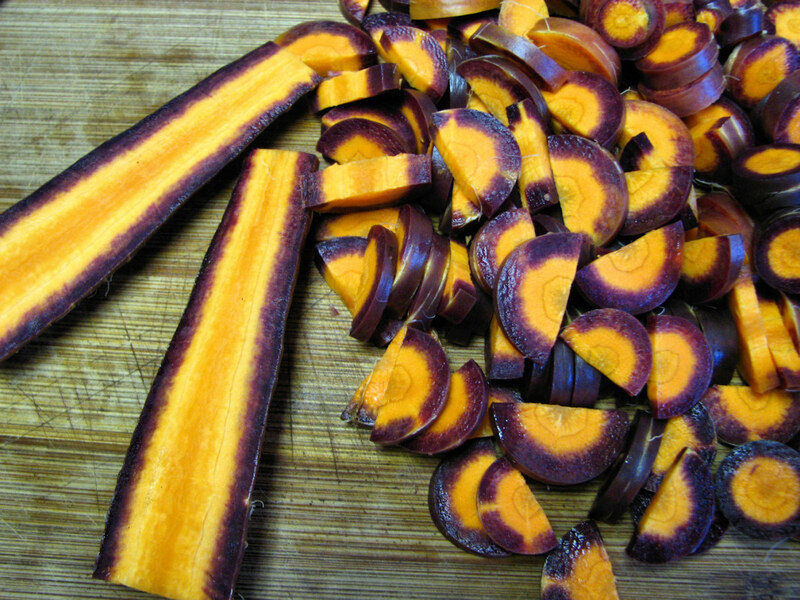 The purple carrots were a lovely addition to the dinner table. The purple cabbage handled the hail faily well, but they never did quite start to form proper cabbage heads. 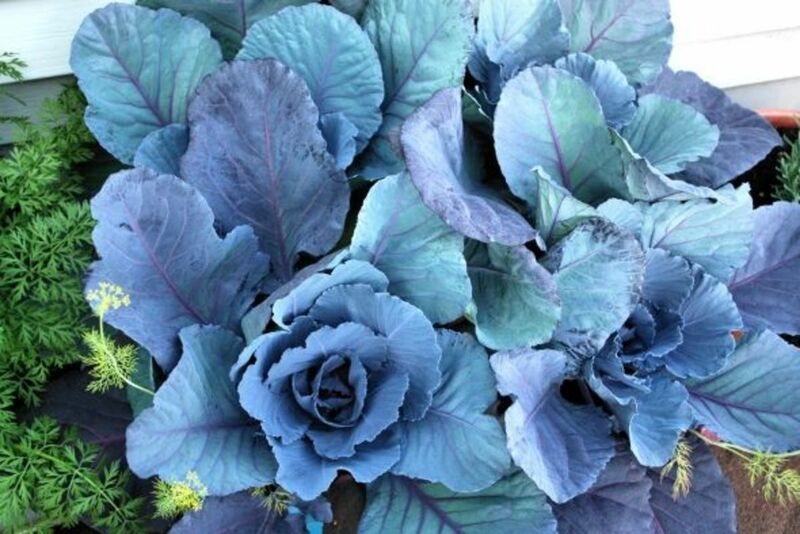 Next time, fewer cabbages per pot. The lavender did okay, but didn't produce a lot of flower spikes. Not enough for the crafting I wanted to do. Spearmint blossums. We had enough to make a proper fresh mint tea. Very nice! New for 2014 - We've moved to a new unit and need to discover our new balcony quirks and conditions. We stored our pots under our new balcony. 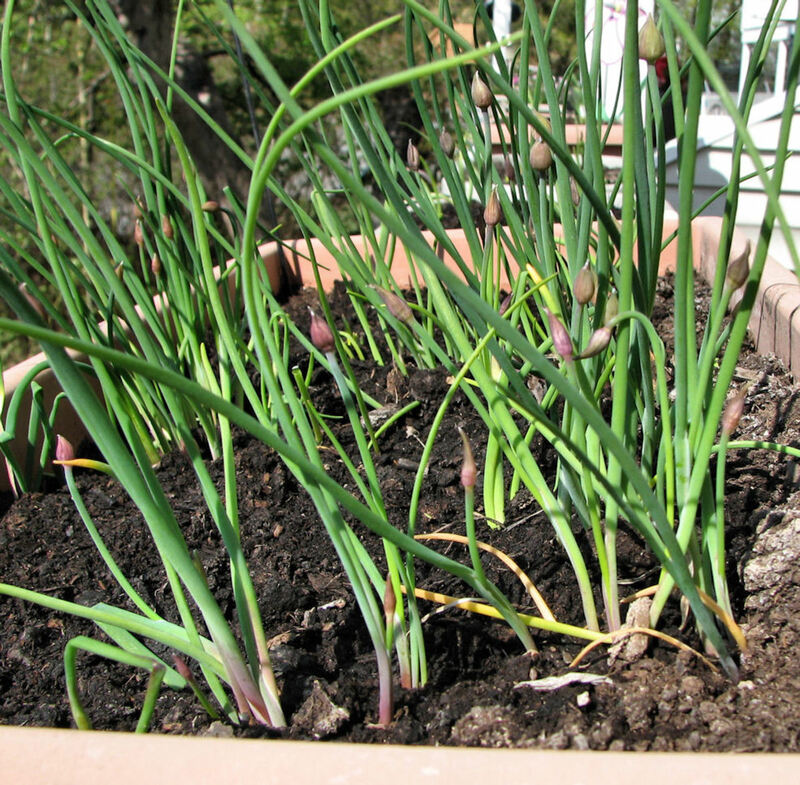 As we brought this one out, we found chives already growing! 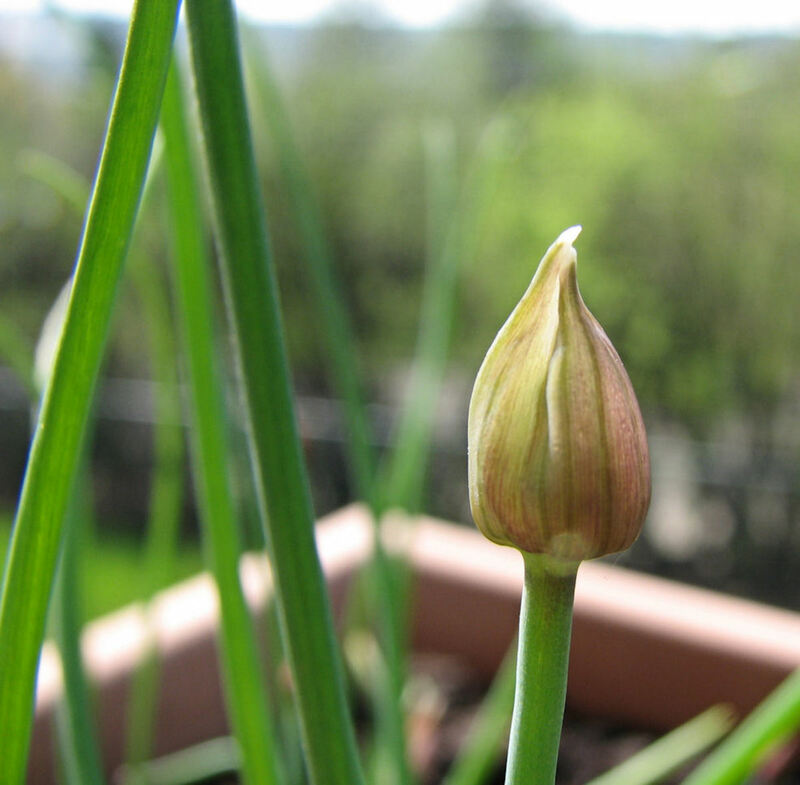 A could of shallots filled in some empty space with our garlic chives. Chive blossoms can be a nice salad addition. New transplant of mixed salad greens. 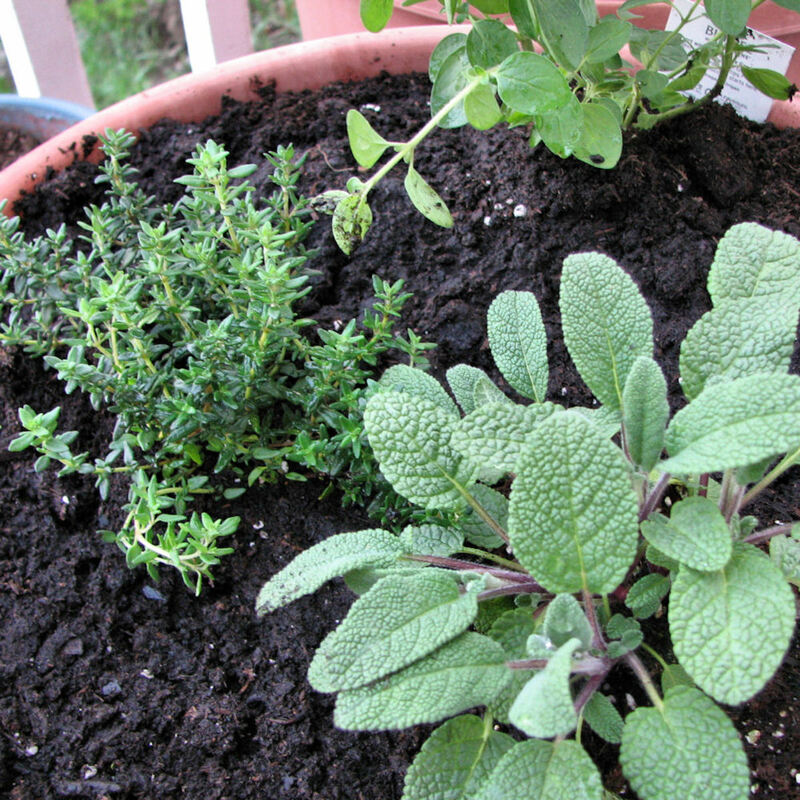 Sage, thyme and cilantro share a pot. Planters with new transplants, seeds and garlic cloves, set up on our new pallet planter platform for easy rotation. We now have a tiny third floor balcony, which my daughters share. The former occupants were kind enough to leave most of their planters for us. My older daughter salvaged a broken shelf from work, sawing off the broken portions to make a tiered holder for her sister's pots. 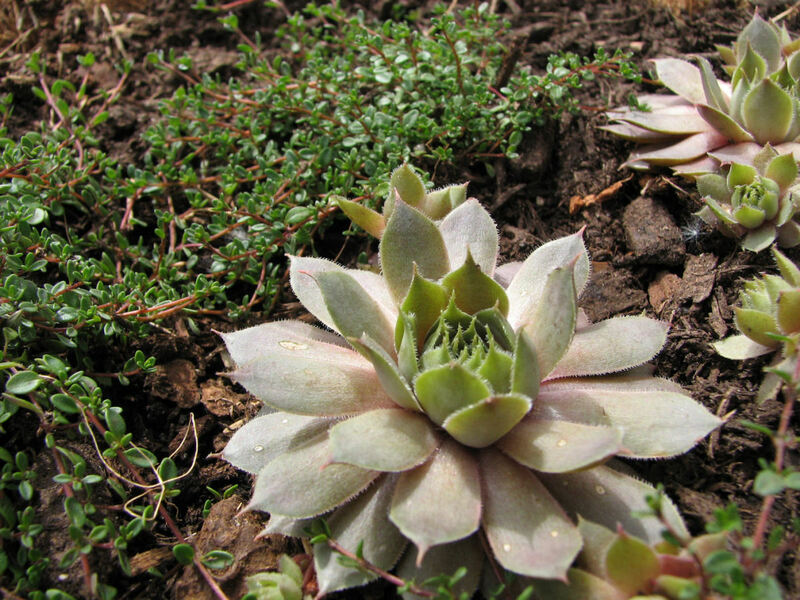 My older daughter's new transplants; Hens and Chicks and a creeping thyme. My daughter mounted a hanger quite low for more Hens and Chicks with creeping thyme. A close view, just because I love macro photography! These alyssium have such a wonderful scent! A bird's eye view of our first floor balcony, where we have a total of 4 rail planters, plus our movable planter platform. Is balcony gardening for you? Yes, I already have a balcony garden! Yes, I have a balcony and can't wait to start. No, I don't have a balcony to garden in. 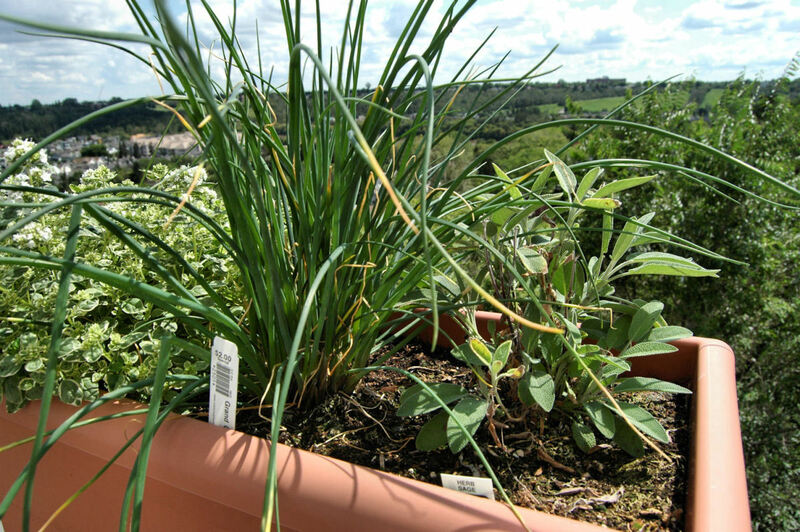 One of the benefits of gardening on your balcony in containers is accessibility. For some, it's not quite enough. I live in a co-op with a number of members with mobility issues, ranging from painful arthritis to needing walkers or wheelchairs. Visit my Accessible Garden Beds hub, and follow along our planning process. I think your best bet would be to visit a local hardware store that sells concrete and ask. I think they would be more likely to have products to protect concrete than a garden centre. I have a balcony "garden" but never realized until it was too late that the concrete below the pots and containers would end up getting severely stained. How I wish I would have known or understood that I needed to put protective under trays in order to protect the concrete. Now I am trying to find something like this and so far as yet, have not been able to locate any such trays and am hoping you can direct me as to where I can find something like this? Wow! 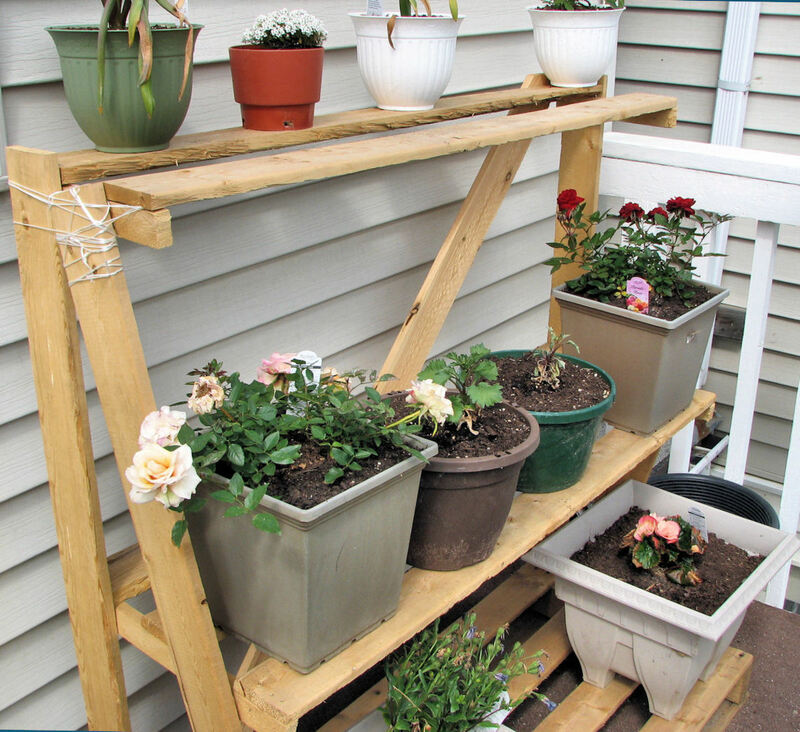 This was one of the most informative posts I've read about container planting on a balcony. Last year I tried and failed due to not researching and starting late. Trying to find informative blogs on how to garden in an apartment and this was so helpful! Very informative about your garden. I'm really excited to have found your page! I moved into a condo downtown (based off your pictures I'm certain we actually live very close to each other) and made my first journey into balcony gardening (on a very small scale). I hope to use your tips and experiment with some of your veggie choices (yay! someone who actually lives in the climate I do) next year to expand on my garden. Thanks! This lens was absolutely amazing. I love how you shared pics of all your crops. I started a balcony garden this year, and I am learning a lot as I go. Thank you for this very useful lens. I've started a balcony garden a few years back and still have lots to learn. It's hard to keep my plants alive during the winter months. I don't have a lot of space, so I can use many of your ideas here. Thanks!!! It doesn't take long at all for farm girls who move to the city to miss their home grown vegetables. A few trips to the grocery store, considering the cost of vegetables and the tasteless produce, we quickly desire our own gardens again. A balcony garden is perfect for city dwellers! Congratulations on your purple star and getting Lens of the Day! I loved your close up photos. You've inspired me to start a garden. @Aibrean82: Thanks! I'm so glad you enjoyed it. Feel free to come back and leave comments on how things worked. I'd love to hear about it! We've just moved ourselves and now have two balconies and very different conditions. I'm planning to keep a record of the differences and how things turn out, and updating the lens as we go along. I am so excited to find this lens right now. In July we will be moving into a new apartment, which has two balconies! We have already decided to start a balcony garden, with edible plants. Unfortunately both balconies are covered, so not a lot of sunlight or rainwater will help us in our efforts, but we are determined to have a go anyway. At least it will be sheltered from hail storms, haha! I am bookmarking this lens for future references. Thank you so much for sharing your extensive knowledge and experience on balcony gardening! With all this fighting over GMO and non-GMO, providing simplified vegetable gardening tips is very valuable information. Very inspiring. Thanks. I have started a little garden on my sunny Buenos Aires balcony. It's a new adventure. The space to raise seedlings is a bit of an issue. I'm trying to replant bought things to see what happens. In other words if I replant an onion that was sprouting will I get more?? I've replanted some radishes as well. I'm looking forward to seeing what happens! Thanks for the tips. My brother just moved into a condo with a balcony and we've been wondering how we might jazz it up some. Congratulations on your award, LOTD. I enjoyed reading your lens and seeing your successes. Gardening seems to be Win a few, lose a few for me, too. But, I am drawn to it in the spring. Great job on putting your lens together. VERY NICE LENSE. GOOD KNOWLEDGE BASE. BUT, TO MY PITY, I DON'T HAVE A BALCONY, INSTEAD I'VE A HUGE GARDEN AREA, BUT, I LOVE TO GROW FRUITS AND VEGIES. I HOPE TO GET IT AND WOULD TRY YOUR MENTIONED WAYS. Congrats on your LOTD! A beautiful piece of work! I remember a summer or two ago my mom had a really good container garden going. There was squash, peppers and a tomato plant growing. The tomato plant didn't fairy well but the squash and peppers did great. Currently, I - myself - have planted some tomato seeds [all are sprouting], kale, spinach and lettuce. All are fairy well. While my mom has planted cabbage, tunips and beans of which all are doing great. Going to share pictures soon; possibly within the hobbies lens I got since I don't have a lot of info to create a separate lens. Awesome lens and thanks for sharing. Awesome lens, everywhere i look on this website gives me inspiration to start something new. Good job on LOTD, some real heart went into this, i can tell! Congratulations on Lens of the Day! What a great lens here. You've included so much information. It makes me want to try one this summer. Thanks for putting it together. Fantastic lens! I have the book lasagna gardening and love it! best of luck on your veggies! I hadn't thought of using storage bins for my garden- what a great idea! Congrats on lotd, well deserved! Great info. My wife has been wanting to start a small herb garden for quite some time. This may help her a great deal. I love your lens - you have some really awesome photos too :) thanks for sharing!! This is a very well done, complete and thorough, helpful article! Enjoy it very much. Marvelous lens! Everything you need to know about container veggie gardening. You could even use these tips for an awesome container garden on your patio or deck. I'm a fan. 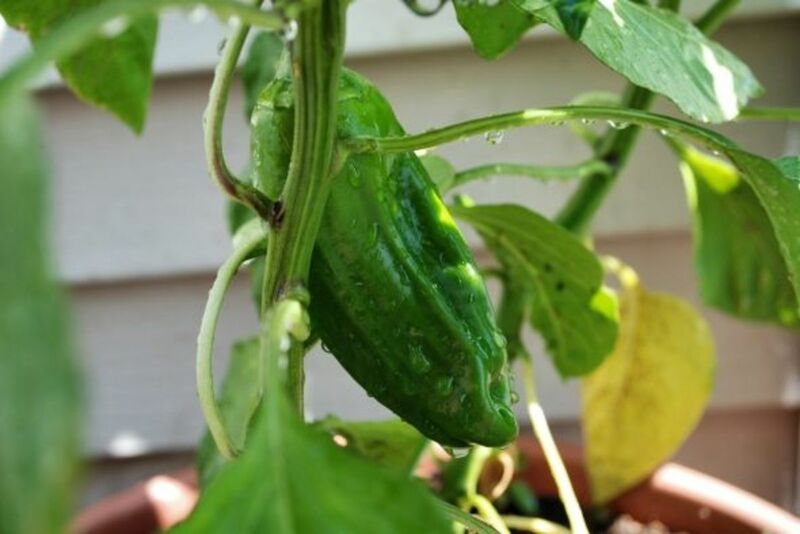 A very interesting and informative gardening lens! I want to try vertical gardening soon. We can always make more space by looking up! Great tips, very informative lens. Love your ideas. Growing plants on the balcony is great idea. In used to grow some herbs this way. Great lens! Thanks for all of the tips and advise, a very informative lens, I don't have a lot of room to plant where we currently live, so I can sure use a lot of your ideas. Congratulations on LOTD!!! I'm not much of a gardener but this is a terrific lens. Congratulations on getting LotD! Congratulations on LOTD! This is a great balcony garden you have...my cousin in Germany has one of the most beautiful Balcony Gardens I've ever seen...they do that a lot of these gardens in Europe because the lack of space. Very nice, enjoyable lens! Congrats on LOTD and Happy Gardening! Congratulations on having this featured as Lens of the Day. I love this type of gardening. I don't have a balcony, but I'm sure I could do the same thing on my deck. Thanks for the great advice. Congratulations on LotD! I have a yard, but I always put containers on the porches, too. I love container gardens. Thanks for all the wonderful inspiration and congratulations on your Lens of the Day! Very Good lens. 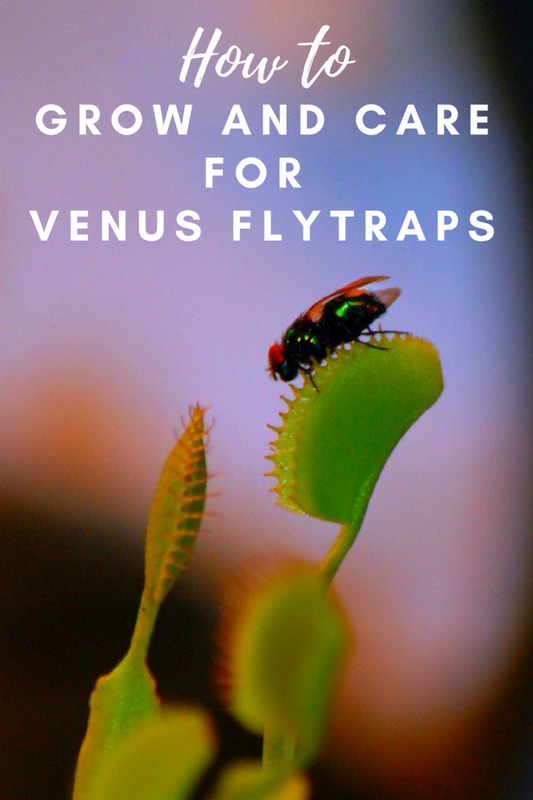 If you have a problem with bugs, have a look at my lens about creepy crawlies. It started out serious, and turned out to be funnest thing I have ever done on the internet. We are thinking of doing just this due to living in Nova Scotia where this year in particular the winters can be long and hard. It tends to make garden growing very hit and miss, as your early plantings often get hit by late hard frosts, torrential rains and or hail. I really like this lens as it is full of useful information and ideas. Well done on the LOTD. really really cool! Im in love with succulents and I will pick up great ideas here. I live in tropical weather succulents work best here but still I like small pocket gardens all over my space. I enjoyed this lens! You have a lovely balcony garden. We do have a balcony, but we can't use it for some reasons and it's too small anyway. My family has tried gardening but our plants never survived. Just a couple of days ago, my sister tried planting some peppermint. She did a lot of research so I hope it will succeed! She named it Pepper lol. I have sent her a link to your lens because I'm sure she'll love it! Good suggestions for how to garden in limited spaces. Congratulations on LotD. I'm lucky I have both, I use my deck to plant a lot of my herbs because it's closer to the kitchen. In the garden proper the rest of the stuff gets planted! Love your lens! It's been featured on our G+ page today! I had a small container garden - small area, not small in plantings, until this year. I am fortunate enough to have a yard, now. I enjoyed your garden and reading, very much! Great lens! I'm going to start a container garden this year. Thanks for the terrific lens! I used my deck to grow tomatoes in deep planters. I found the planter pots in the dumpster! When it got cold, I brought them inside in front of my south facing sliding glass door. They are still producing! I used to have a balcony garden, but when I moved I lost the balcony! It was nice, a balcony feels so private and secluded... a secret garden. I love your garden pictures! I was very interested in balcony gardening and will be back to read more. 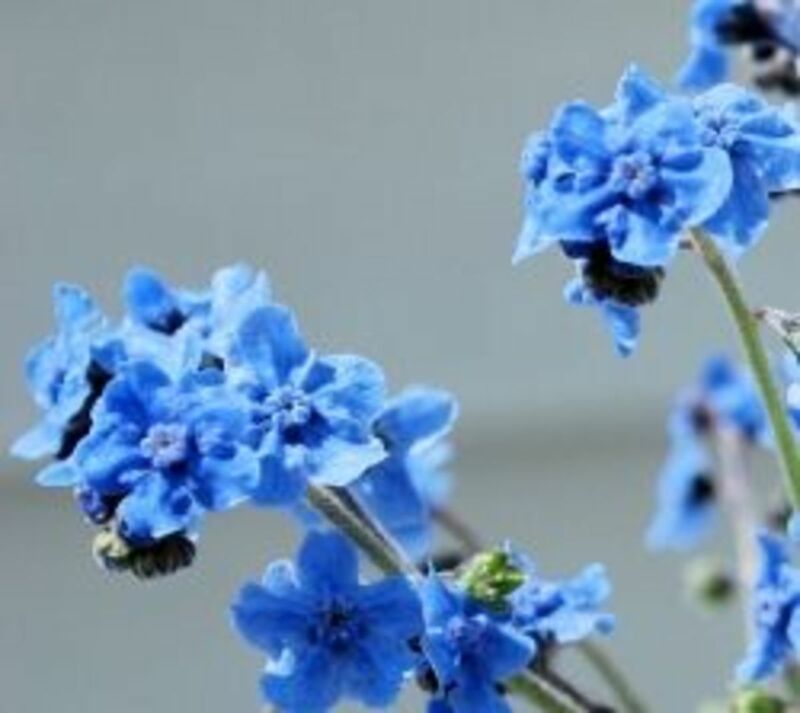 You love gardening and do it so wonderfully on the balcony. @KathyMcGraw2: Many thanks. :-) Feel free to let me know what you decide to plant in your container! I remember this article very well, and like seeing the addition of the new vegetables. Thanks as I just learned what to plant with what, and the hint about dill and it keeping the bugs away will help. I also have a large storage container that is just sitting around, so will follow your tip of drilling some holes in the bottom and making it a planter too. A lot of great tips here! I'm fortunate to have space for a garden in the ground now, but I first started my veggie gardening on a balcony. @Rangoon House: Thank you so much! You have my hugest blessings for Spring and Easter. I loved reading your story from your farm to your balcony. I hope your crop is bountiful! @emmesinger1: Thanks for coming back! I'm glad you enjoyed it. Just went and looked at the lenses you mentioned. I found the tattoo one really interesting. I don't know of any gardening related charities, though. After I translate this into Romanian, I'm going to show this to my mom. She loves gardening. She says it's quite relaxing. 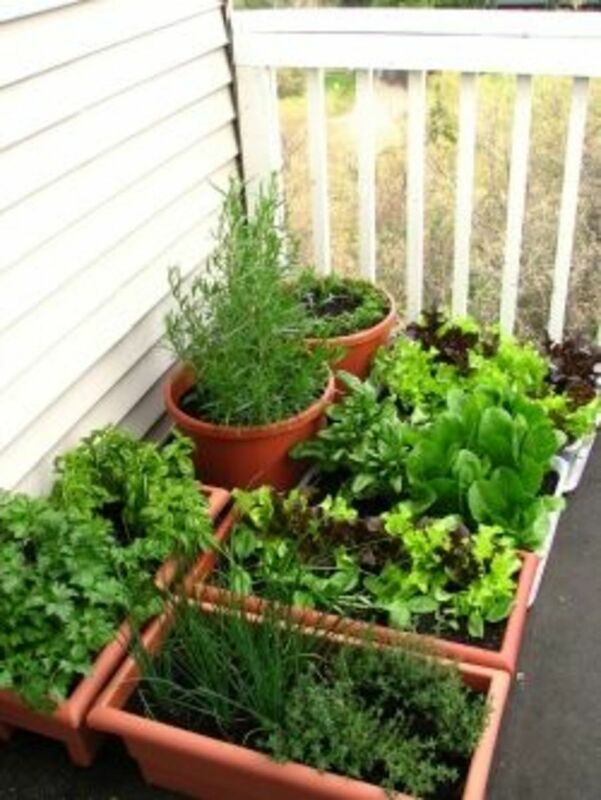 Great ideas for balcony gardens and gardeners. It is great for city folks to see that they can grow their vegetables even with limited space. Balcony gardening is a great opportunity for people to start eating locally, I mean it doesn't get much more local than your own balcony. Some very good advice here! Thanks. @AnnaMKB: Both! My good hubby-buddy taught me 'bout the cultured kind, first. Then, he introduced me to the real stuff. mmmmmmm; good. Mmm... Buttermilk! Do you mean the cultured type, or the kind you get from actually making butter? I sometimes wish I loved balcony gardening. You have so much great information on this page. Sadly, I am someone who grew up without a garden, so I never learned to love gardening. However, after marrying my gardener hubby, I did learn to love fresh fruits an' vegetables. Oh, yeah; an' buttermilk. We are trying to get back out into the country, now. Wish us luck. Heavy clay can sure be a challenge! My sister has been struggling with that in her garden for years. She still manages to grow most of their own food, though! 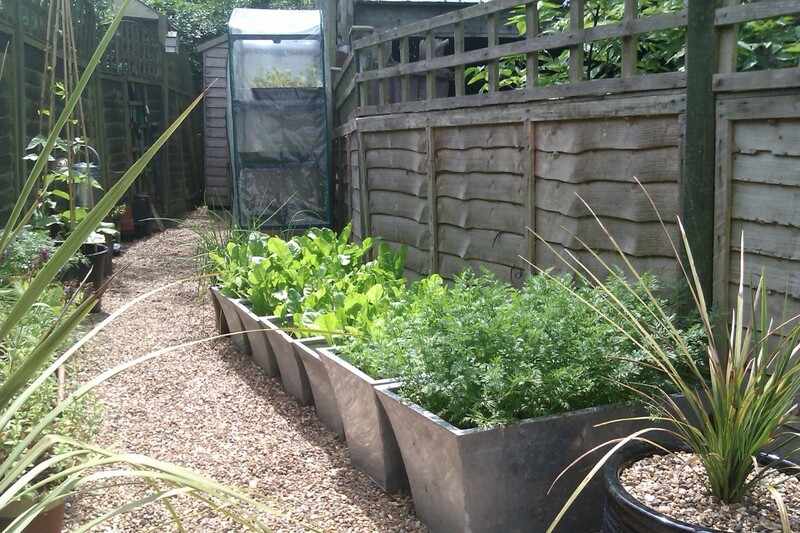 Containers and raised beds are a good way around that. Have you looked into Lasagna Gardening? It's a great way to build up healthy soil without huge amounts of manual labour. I have a link in the Gardening Methods section above. 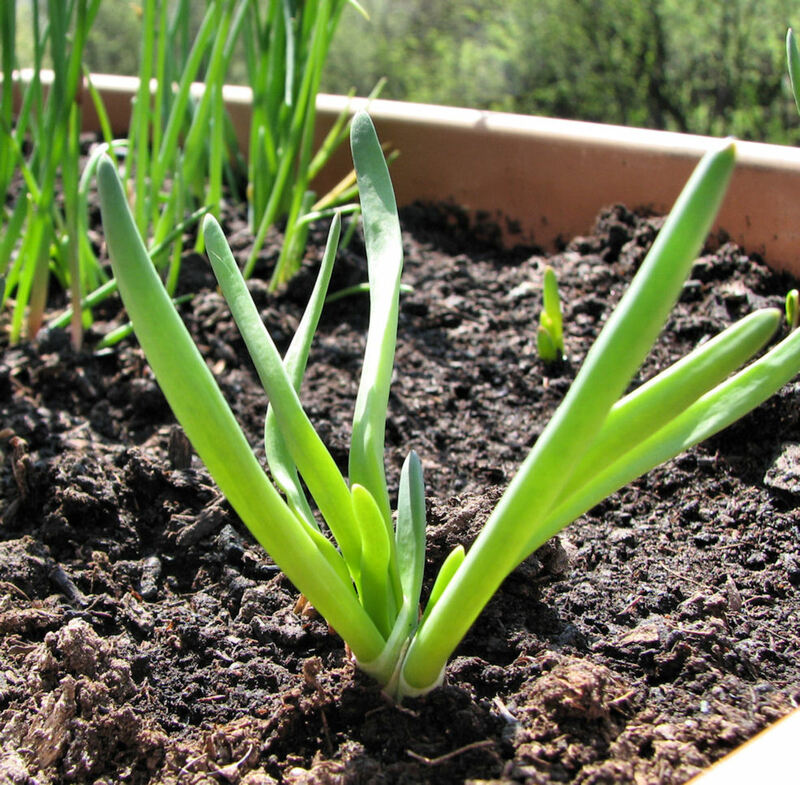 That and Square Foot Gardening are excellent methods to work around difficult soil types. I enjoyed reading this page :) I don't have a balcony, we have a garden but due to it being very heavy clay I still do grow quite a few things in containers or raised beds. I love all the flowers but also getting serious about herb and veggie gardening this year. I think everyone can grow something no matter how small the space. @julieannbrady: Thanks. It's surprising how much people can grow on even tiny balconies! Well, I did have a balcony in my last place and sure would have tried one of these. Love the concept. I love to garden! Great ideas! Thank you this is a really good lens on gardening in limited space. I hope more people are encouraged to do that. @KathyMcGraw2: That's awesome! Hanging baskets are something I haven't been able to do, but now that I see those stands, I might be able to manage some.